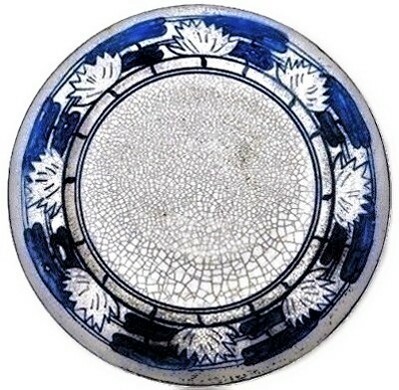 The Dedham Pottery Company; Hugh C. Robertson visited the Centennial Exposition in Philadelphia and viewed pottery from China with a blood red crackled glaze that would inspire him to create his own version. 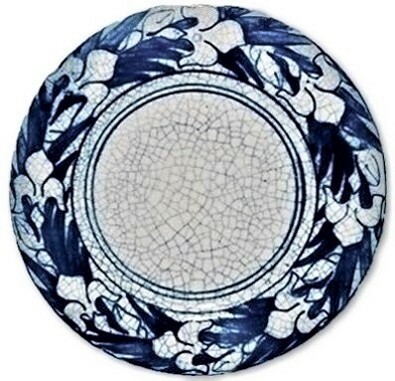 In 1867, the Robertson family founded their first company in Chelsea, Massachusetts on the corner of Marginal and Willow Streets, a predecessor to the Dedham Pottery, called Chelsea Pottery U.S. Chelsea Pottery U.S. closed in 1895 and the company moved on to Dedham, MA where Hugh C. Robertson, a fifth generation Scottish potter, opened Dedham Pottery in 1896. The most recognizable design is a repeating crouching rabbit referred to as "the Dedham Rabbit". The rabbits crouch with their ears back and in between each rabbit stands a vegetable stalk which a former workman claimed to be a Brussels sprout. 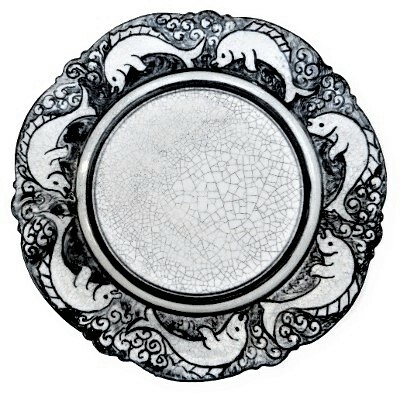 There are normally 10 rabbits hand painted in a clockwise rotation. 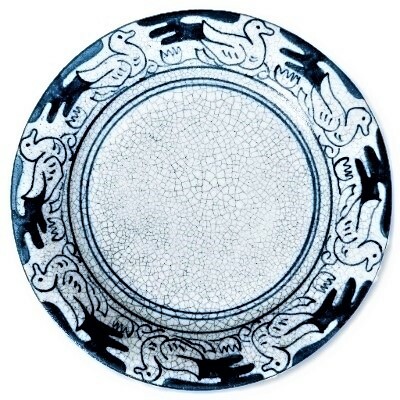 The Dedham Rabbit design was created by Miss Alice Morse and J. Lindon Smith of the Museum of Fine Arts School in Boston after winning a design contest put on by the founding members of the Dedham Pottery. Other designs featured were elephants, dolphins, polar bears, chicks, swans, turtles, ducks, butterflies, lilies, clover, and mushrooms. 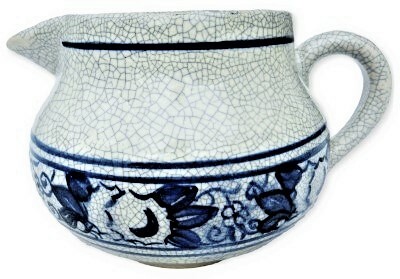 During its years of production, Dedham Pottery created over fifty patterns. (1891-1895) C.P.U.S. (Chelsea Pottery U.S.) impressed inside a clover leaf. Some items may have only a single impressed foreshortened rabbit prior to the use of the square blue back stamp. 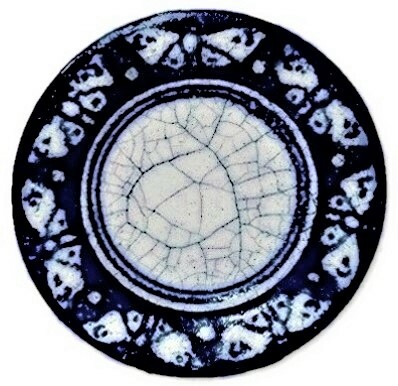 (1896-1928) Square blue stamp with DEDHAM POTTERY printed over a rabbit; impressed foreshortened rabbit beneath. (1929-1943) REGISTERED added under standard Dedham Pottery stamp; two impressed foreshortened rabbits beneath. Rarely the decorator would add his or her initials, a date, or the initials of the purchaser but these instances were rare and therefor, for collecting purposes, valuable. 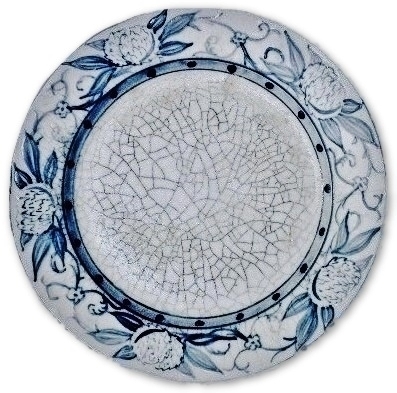 (1904-1928) Maude Rose Davenport was a very skilled decorator at Dedham Pottery. She signed her work with a rebus, a small circle hidden in the border of her works. (1879-1908) Hugh C. Robertson signed his decorations with the monogram HCR or a small square hidden in the boarder design until his death in 1908. The items offered for sale on this page are antique/vintage. 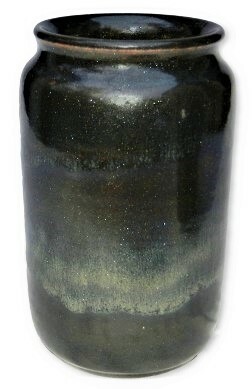 Items should be expected to have normal anomalies present, such as glaze crawl marks, tool marks, slight spotting from the making in the finish, normal use shelf wear, small bubbles which may or may not have opened during the firing process or light edge wear roughness to the touch which would not be considered as post production damage. 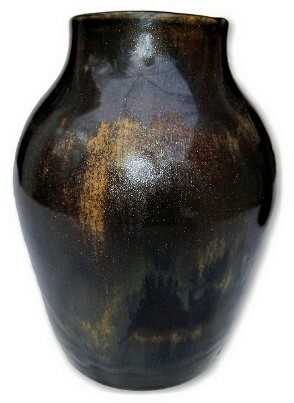 CHELSEA KERAMIC ART WORKS 1879-1889, Hugh C. Robertson (1845-1908) experimental stoneware vase with a spectacular "Tiger Eye" flambe glaze. 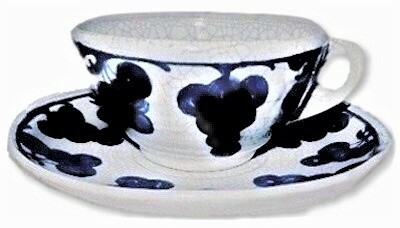 This extraordinary masterpiece of American arts & crafts movement in ceramics is a one of a kind and truly spectacular example. 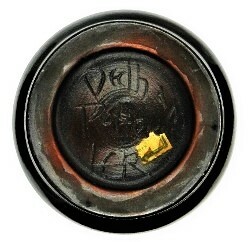 Stamped CKAW and possessing its original sales sticker which reads in hand printing; "Dedham 95.00". Stands 6 1/2" tall and measures 4 1/2" across at the widest point. No chips, cracks or repairs. 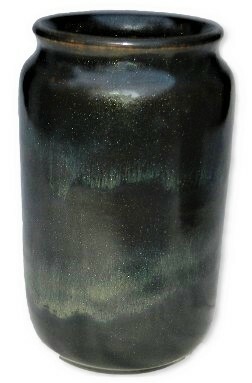 DEDHAM POTTERY Hugh C. Robertson (1845-1908) experimental stoneware vase with silver stone flambe glaze. 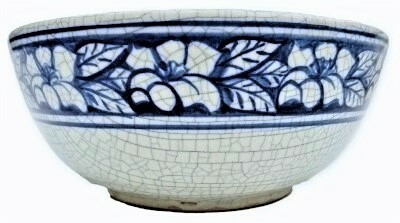 This extraordinary masterpiece of American arts & crafts movement in ceramics is a one of a kind and truly spectacular example. Hand inscribed on the base "Dedham Pottery HR". The exterior glaze is a gun metal flambé color with millions of tiny silver flakes trapped within. Stands 6" tall and measures 3 3/4" across at the widest point. The interior color is the opposite of the exterior in shades of reddish amber to burnt amber. The base is covered in an oxblood red finish. No chips, cracks or repairs. 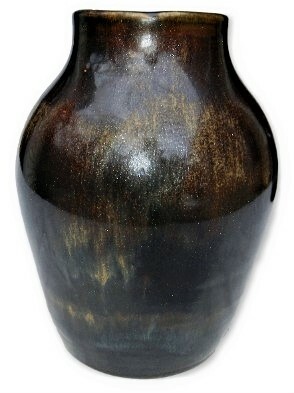 DEDHAM POTTERY Hugh C. Robertson (1845-1908) experimental stoneware vase with gunmetal and gold stone flambe glaze. 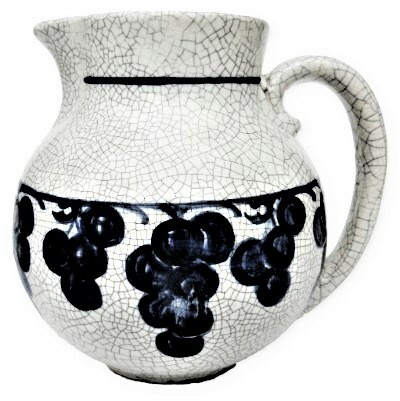 This extraordinary masterpiece of American arts & crafts movement in ceramics is a one of a kind and truly spectacular example. 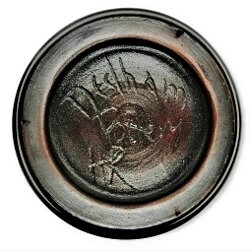 Hand inscribed on the base "Dedham Pottery HCR" along with the remnant of a paper label where the last letters of a word "ORK". The exterior glaze is a gun metal flambé color with millions of tiny gold flecks trapped within. The depth that the gold stone effect offers is unsurpassed by any wares of its era. 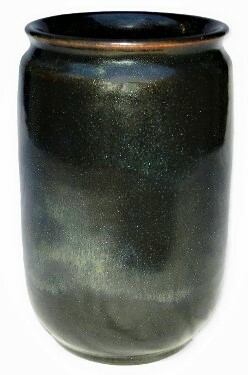 The vase stands 6 1/4" tall and measures 3 3/4" across at the widest point. The interior color is the opposite of the exterior in shades of reddish amber to burnt amber. The base is covered in an oxblood red finish. No chips, cracks or repairs. DEDHAM POTTERY "AZALEA" large 8" No. 2 bowl. Marked with the 1929-1943 REGISTERED back stamp. Measures 8" across and 3 1/4" high. No chips, cracks or repairs. DEDHAM POTTERY "AZALEA" large 9" No. 1 bowl. Marked with the 1929-1943 REGISTERED back stamp. Measures 9" across and 4 3/4" high. No chips, cracks or repairs. DEDHAM POTTERY "AZALEA" whipped cream bowl. Measures 7 1/4"across the flared rim and sits 2 1/2" high. Marked with the REGISTERED back stamp dating this item to 1929-1943. A superbly clean example. No chips, cracks or repairs. 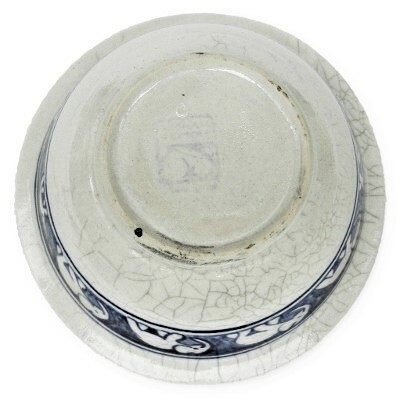 DEDHAM POTTERY "AZALEA" bacon & egg rasher with 1929-1943 back stamp. 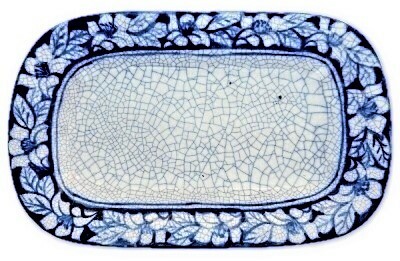 This form is listed in Dedham Potteries catalog as both a celery tray or bacon & egg tray. Meansures 10" X 6 1/4" X 1 1/2". The bottom foot edge has a in the making base rim chipping from the making which appears as chipping due to glaze pulling and the subsequent ceramic losses. No other chips, cracks or repairs. 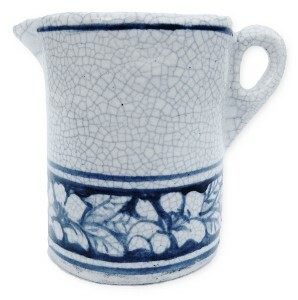 Dedham Pottery "AZALEA" No.13 mini creamer. Measures 3" X 2 1/4". 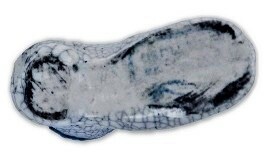 The blue stamp mark is so faint that we will represent this rare form as unmarked. 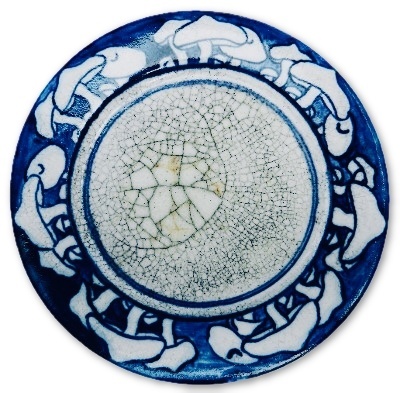 There is a tiny flea bite on the bottom rim which appears to have happened when the pitcher was removed from the kiln. No other chips, cracks or repairs. 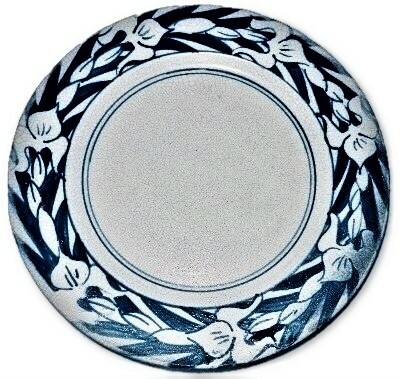 DEDHAM POTTERY "AZALEA" pattern 1929-1943 back stamp 8 1/2" breakfast size plate. No chips, cracks or repairs. 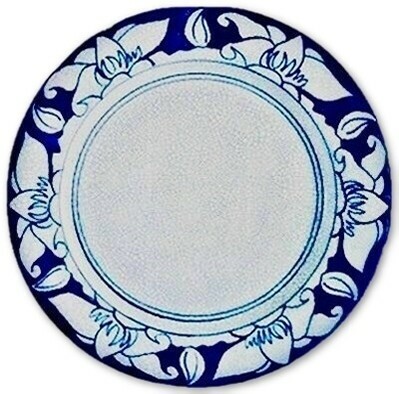 DEDHAM POTTERY "AZALEA" pattern 1929-1943 back stamp 8 1/2" breakfast size plate. There is glaze crawl around the boarder pattern boarder as well as some crawl on the reverse side from the manufacturing process. No chips, cracks or repairs. 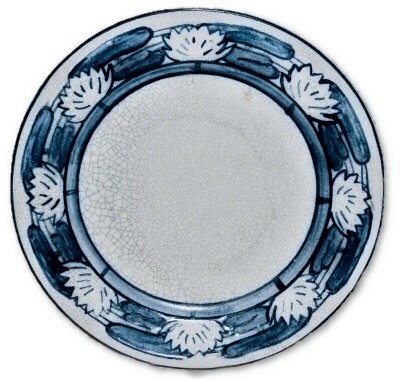 DEDHAM POTTERY "AZALEA" pattern 1896-1928 back stamp 8 3/4" breakfast size plate. Very minor roughness to the outside rim and in the making glaze crawl. No chips, cracks or repairs. 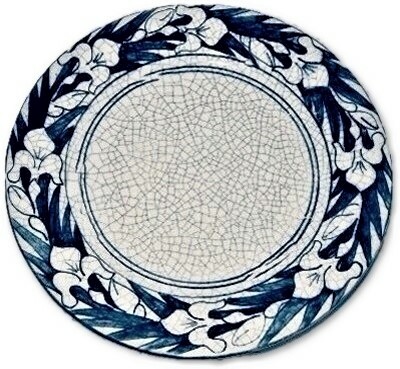 DEDHAM POTTERY "AZALEA" pattern 1896-1928 back stamp 10" dinner size plate. 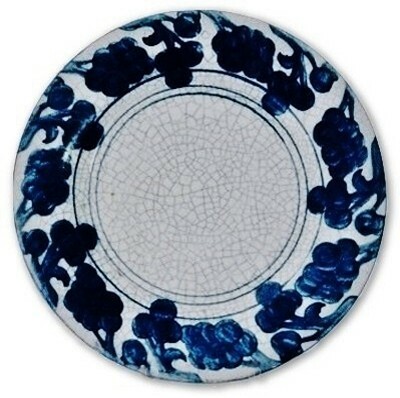 Signed with Maude Davenports REBUS mark in the boarder, this plate will date between 1904 and 1928. No chips, cracks or repairs. "BIRDS IN A POTTED ORANGE TREE"
CHELSEA POTTERY U.S.-DEDHAM POTTERY "BIRDS IN A POTTED ORANGE TREE" pattern 8 5/8" breakfast size plate. There is only one impressed rabbit mark and no blue back stamp showing this example to have been made between 1894-1896. No chips, cracks or repairs. CHELSEA POTTERY U.S.-DEDHAM POTTERY "BIRDS IN A POTTED ORANGE TREE" RAISED pattern 8 7/8" breakfast size plate. There is only one impressed rabbit mark and no blue back stamp showing this example to have been made between 1894-1896. No chips, cracks or repairs. Dedham Pottery "Birds in a Potted Orange Tree" 8 1/2" luncheon plate. 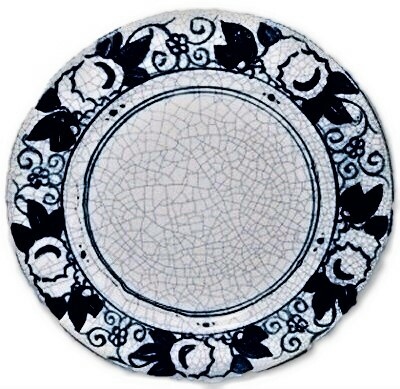 A light pink glaze covers the entire plate and the hand painted decoration has an orange peel effect creating a lightly fuzzy decor. 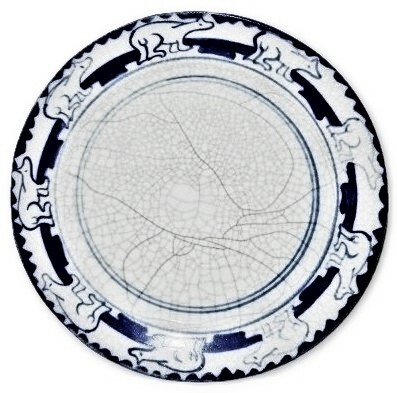 The plate is marked with the 1896-1928 backstamp and a single impressed rabbit. A very small in the making foot ring sliver. No other chips, cracks or repairs. 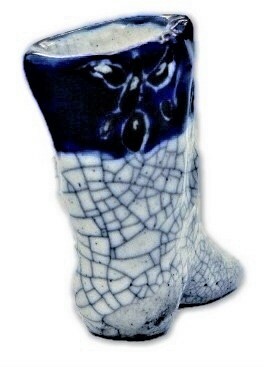 DEDHAM POTTERY small "BOOT" toothpick holder. Hand incised mistletoe and hand painted ribbon bow laces. A very faint 1896-1928 back stamp underneath. Measures 2 1/4" X 1 7/8" X 1 1/8". 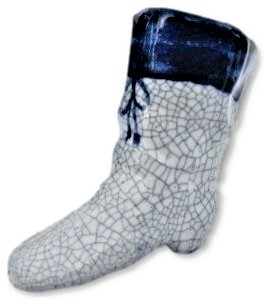 Some glaze loss from the manufacturing process near the back of the boot. No chips, cracks or repairs. 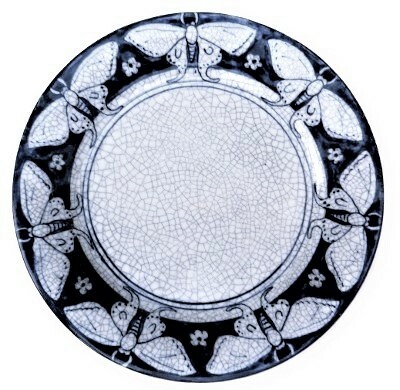 DEDHAM POTTERY "BUTTERFLY" pattern 6" bread and butter plate. Marked with the 1896-1928 back stamp. 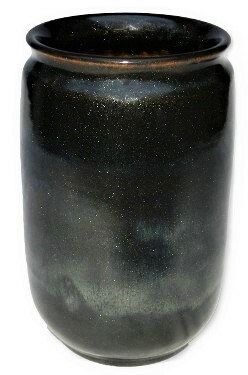 Several tiny burst bubbles along the rim where the glaze did not cover in the firing, allowing small white dots to show. No chips, cracks or repairs. 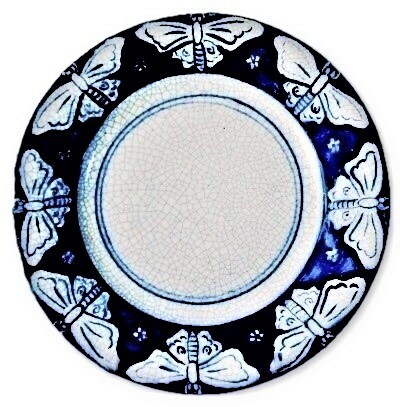 DEDHAM POTTERY "BUTTERFLY VARIANT" pattern 6" bread and butter plate. Marked with the 1896-1928 back stamp. Dark blue decoration with somewhat blurred effect. 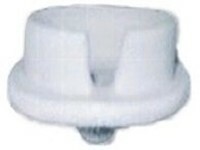 A small base rim chip most likely from the manufacturing process. No other chips, cracks or repairs. 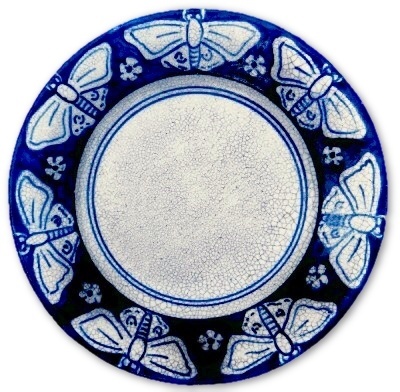 DEDHAM POTTERY "BUTTERFLY" pattern 6" bread and butter plate. Marked with the 1896-1928 back stamp. Dark blue decoration with tight uniform crazing effect. No chips, cracks or repairs. 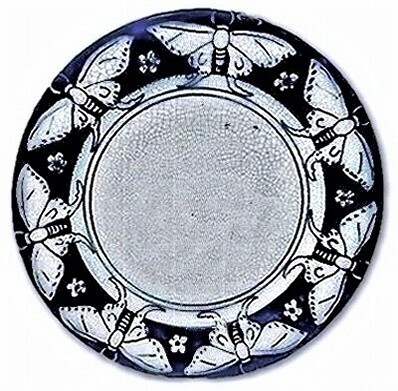 DEDHAM POTTERY "BUTTERFLY" pattern 6" bread and butter plate. Marked with the 1929-1943 REGISTERED back stamp. No chips, cracks or repairs. 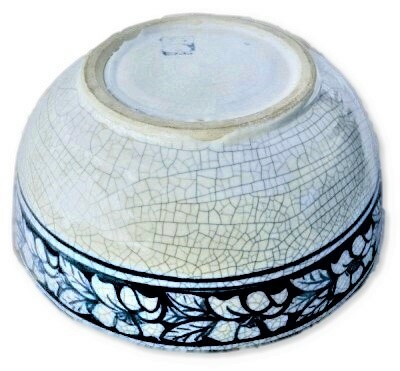 DEDHAM POTTERY rare chocolate pot lid. Measures 3 3/4"across 1 1/4" high and a 3" across insert area. 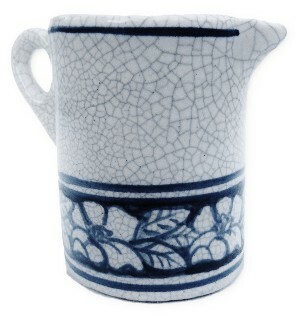 This item can be used with ANY pattern in the chocolate pot shape. A small amount of glaze crawl near the knob. No chips, cracks or repairs. 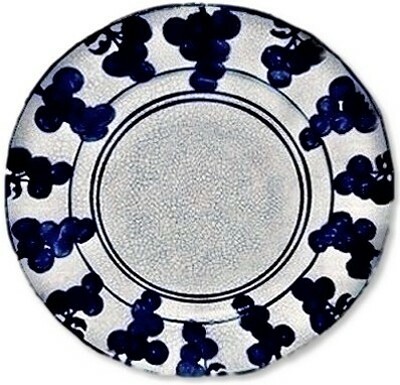 RARE CHELSEA POTTERY US "CLOVER" (raised) pattern 10" dinner plate. Impressed on the reverse CPUS in a clover and an impressed "O". Dates from 1891-1895. One of the finest designs created by Hugh Cornwall Robertson in Chelsea Mass. Prior to starting the Dedham Pottery Company in Dedham Mass circa 1896. No chips, cracks or repairs. 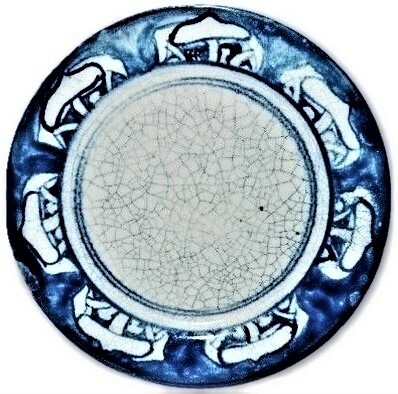 DEDHAM POTTERY "CRAB" pattern 6 1/4" bread and butter plate marked with the 1896-1928 back stamp. No chips, cracks or repairs. 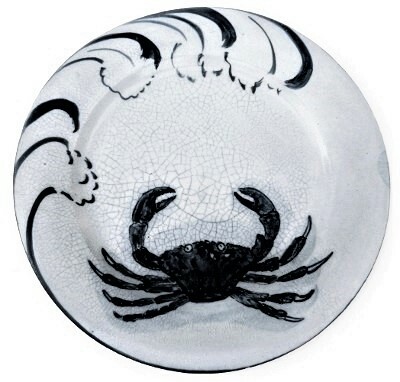 DEDHAM POTTERY "CRAB" pattern 8 1/2" breakfast plate marked with the 1896-1928 back stamp. There is a small glaze skip on the edge. No chips, cracks or repairs. 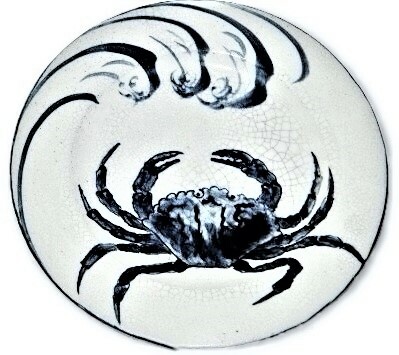 DEDHAM POTTERY "CRAB" pattern 8 1/2" breakfast plate marked with the 1896-1928 back stamp. No chips, cracks or repairs. 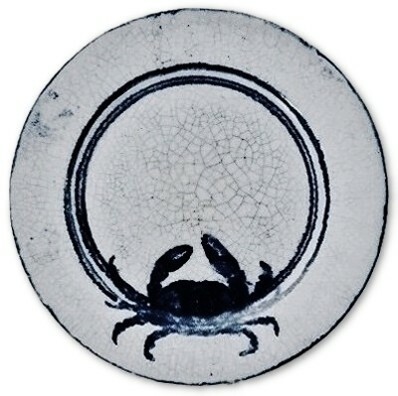 DEDHAM POTTERY "CRAB" Variant (note the simple rings instead of the normal waves) pattern 8 1/2" breakfast plate marked with the 1896-1928 back stamp. Some minor peppering and under glaze smudges. No chips, cracks or repairs. 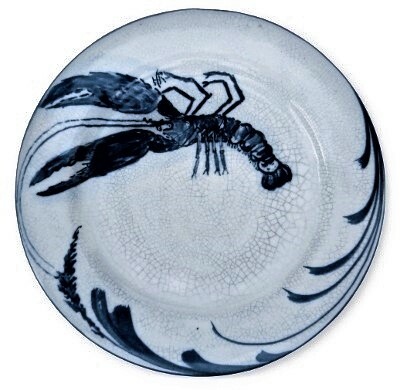 DEDHAM POTTERY "DOLPHIN" artist initialed "B" 6 1/2" bread & butter plate. A scarce pattern in a very difficult to find size. Excellent tight crackle and dark blue decoration. Marked with the 1896-1928 back stamp. No chips, cracks or repairs. 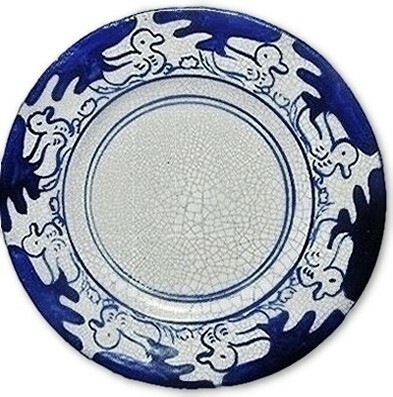 Chelsea Pottery U.S. (raised) "UPSIDE DOWN DOLPHIN" breakfast plate. Marked with the CPUS in a clover device impressed mark dating this example 1891-1895. Rarely are Dedham items artist marked and this example has a clear "F" hidden in the fin of one of the Dolphin. Extremely well executed and decorated, fine crazing. Measures 8 3/4" across. No chips, cracks or repairs. 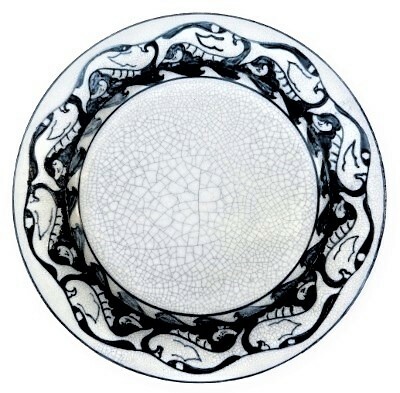 DEDHAM POTTERY "LEFT FACING RAISED DOLPHIN" 8 3/4" lotus edge plate. Artist signed by Hugh C Robertson with a small square device hidden in the pattern between two Dolphin. 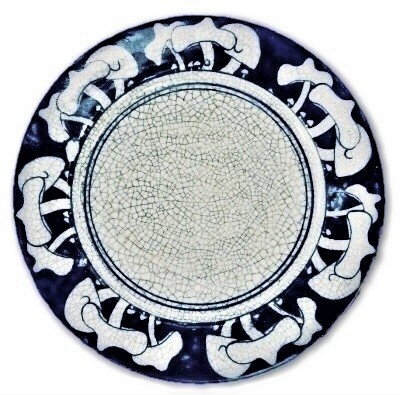 This is one of the finest Dolphin examples you will ever find with only a very small flea bite or two along the edge and a small area where the blue on the edge did not take under the original glaze. 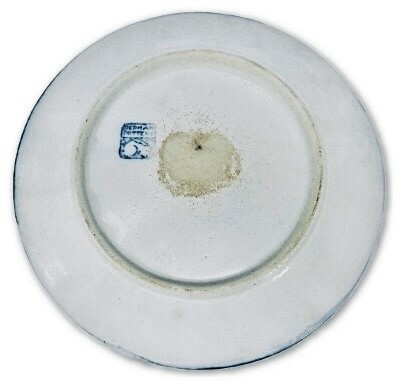 Marked with the 1896-1928 back stamp yet this item was produced prior to Robertson's death in 1908 and most likely closer to 1896 when Dedham Pottery started to use this particular back stamp. Measures 8 3/4" across. A mall in the making dimple near one Dolphins mouth can be seen in the lowest image and is not damage and is also painted and glazed over. No other chips, cracks or repairs. 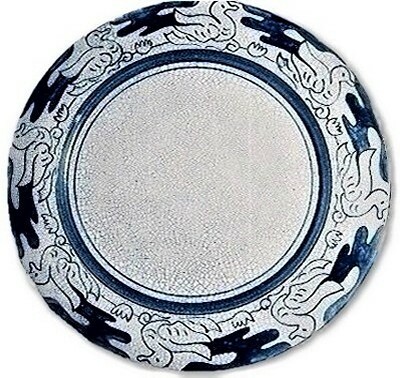 DEDHAM POTTERY "DOLPHIN" 10" dinner plate. A scarce pattern in a very difficult to find size. 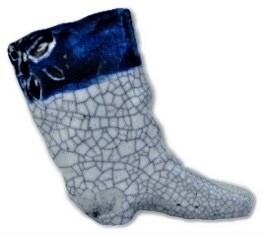 Excellent tight crackle and dark blue decoration. Marked with the REGISTERED 1929-1943 back stamp. No chips, cracks or repairs. 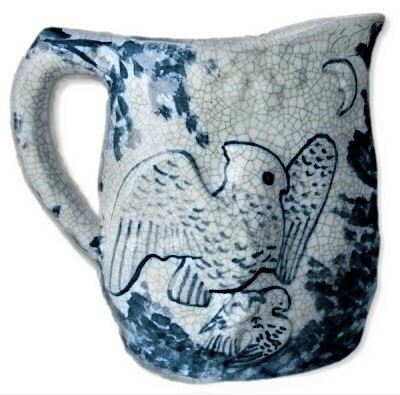 DEDHAM POTTERY "DUCK" pattern No. 5 bowl dated "1931" artist initial "C" with REGISTERED back stamp. Measures 5 1/4" across and sits 2" high. No chips, cracks or repairs. 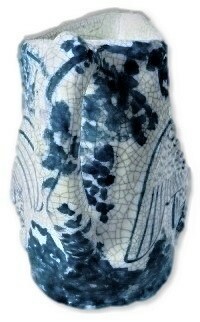 DEDHAM POTTERY "DUCK" pattern No.5 nappy. Measures 5 3/4" X 1 1/2". 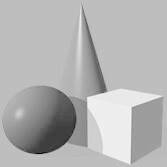 Fairly light art work. Marked with the 1929-1943 REGISTERED back stamp. No chips, cracks or repairs. DEDHAM POTTERY "DUCK" bacon & egg rasher with 1896-1928 back stamp. 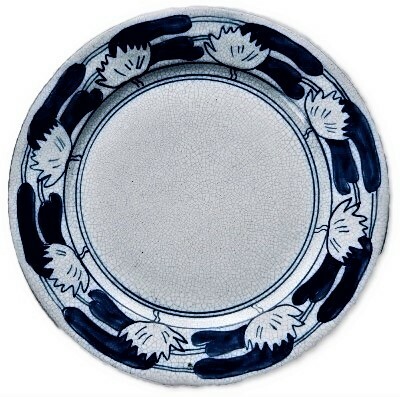 This form is listed in Dedham Potteries catalog as both a celery tray or bacon & egg tray. Measures 9 3/4" X 6 1/4" X 1 1/4". 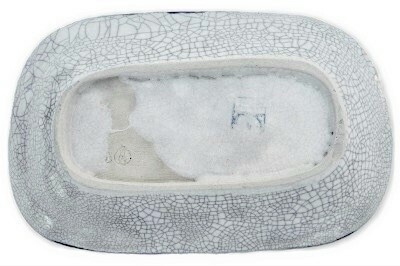 The bottom foot edge has a small in the making base rim flake. No other chips, cracks or repairs. 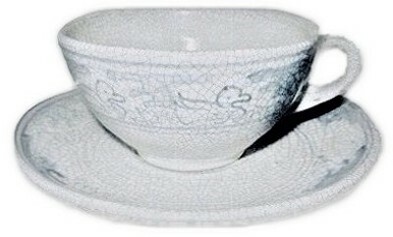 DEDHAM POTTERY tea cup and saucer in the "DUCK" pattern. Marked with the Registered back stamp of 1929-1943. Saucer measures 6" across while the cup measures 4 3/4" across at the widest point and 2 1/4" high. No chips, cracks or repairs. 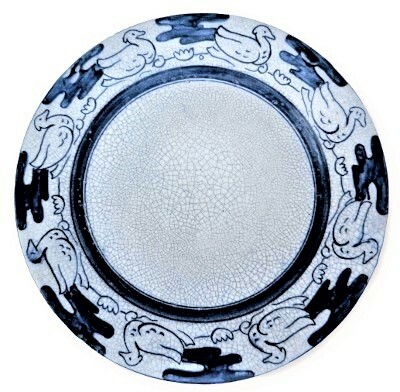 DEDHAM POTTERY "DUCK" pattern 6 1/8" bread and butter plate. Marked with the 1896-1928 back stamp. No cracks or repairs. 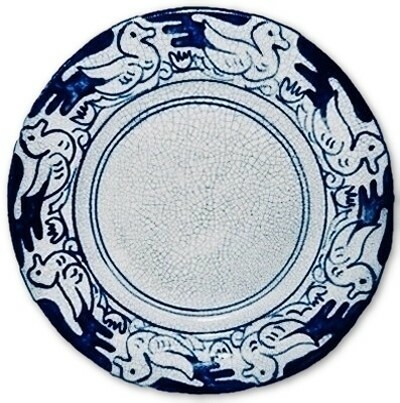 DEDHAM POTTERY "DUCK" pattern 6 1/4" bread and butter plate. Marked with the REGISTERED 1929-1943 back stamp. No cracks or repairs. 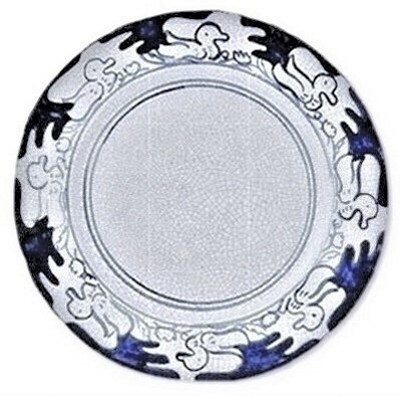 DEDHAM POTTERY "DUCK" pattern 7 1/2" salad plate. Marked with the 1929-1943 two impressed rabbit marks and the date 1931. No chips, cracks or repairs. 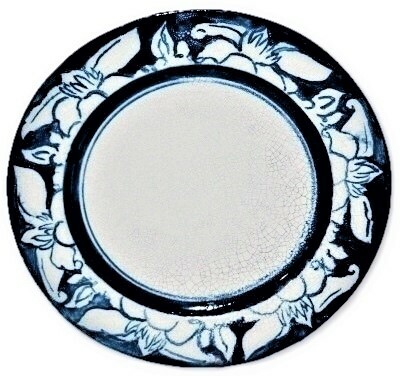 DEDHAM POTTERY "DUCK" pattern 7 5/8" salad plate. Marked only with the 1929-1943 two impressed rabbit marks and no back stamp. 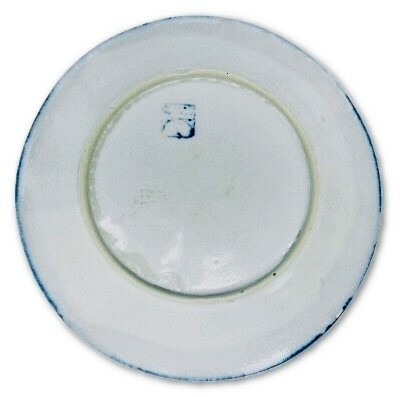 Obviously a factory second, this item has a bulge to the underside of the plate and required the area where the blue back stamp had to be factory ground off in order to allow the item to sit on a flat surface without rocking. There is also a 1 1/4" hairline from the edge of the plate which follows both front and back surface. 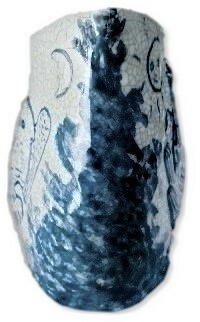 A small triangular glaze flake out of one of the ducks eye as well as a few very small flakes along the hairline on the reverse. It is very possible that this all occurred during the firing process. "As Is Special". No repairs. DEDHAM POTTERY 8 1/2" "DUCK" breakfast size plate. Marked with the 1896-1928 back stamp. No chips, cracks or repairs. DEDHAM POTTERY 8 1/2" "DUCK" breakfast size plate. Marked with the 1929-1943 back stamp. No chips, cracks or repairs. 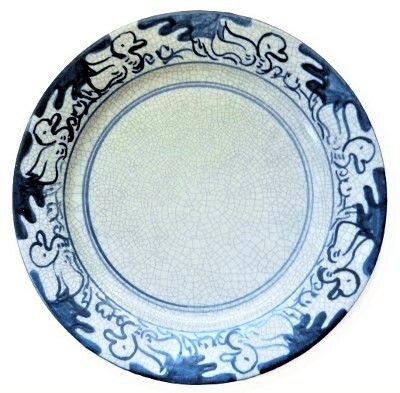 DEDHAM POTTERY "DUCK" pattern 10" dinner size plate, artist signed with the "REBUS" mark of MAUDE DAVENPORT. Marked with the 1896-1928 back stamp. No chips, cracks or repairs. 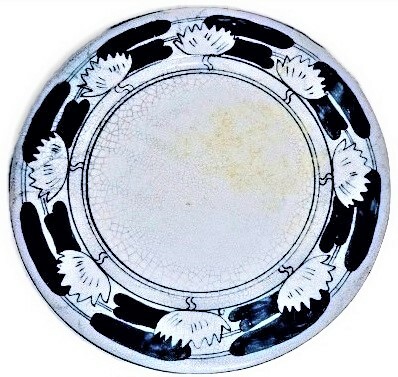 DEDHAM POTTERY "DUCK" pattern 10" dinner size plate, artist signed with the "REBUS" mark of MAUDE DAVENPORT. Marked with the 1896-1928 back stamp. Two manufacturing process nicks on the foot ring which is not post production damage. No chips, cracks or repairs. 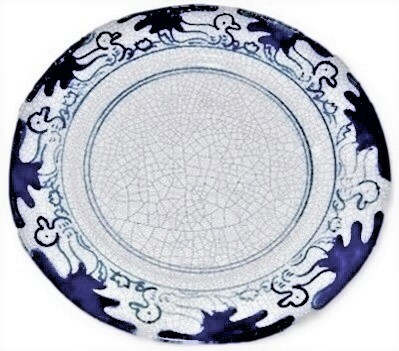 DEDHAM POTTERY "TUFTED DUCK" VARIANT pattern 10" dinner size plate, artist signed with the "REBUS" mark of MAUDE DAVENPORT. 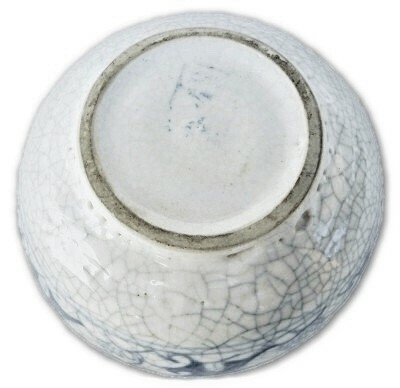 There are manufactures birth marks such as small glaze pops, a glaze skip on the outside edge which occurred during the firing process. There is one 1/4" flat glaze flake. Marked with the 1896-1928 back stamp. Other than the noted condition issues, there are no cracks or repairs. 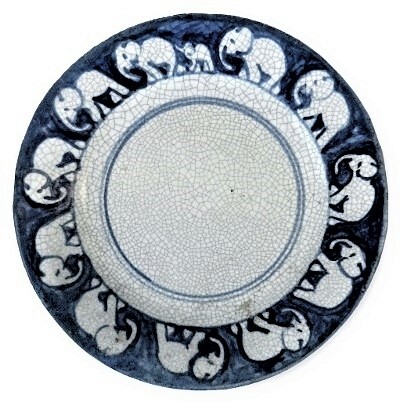 Dedham Pottery "Elephant and Baby" scarce OLD CHELSEA shape bowl. Measures 6 1/4" X 2 3/8". Marked wit the REGISTERED 1929-1943 back stamp. Excellent clean condition, no chips, cracks or repairs. 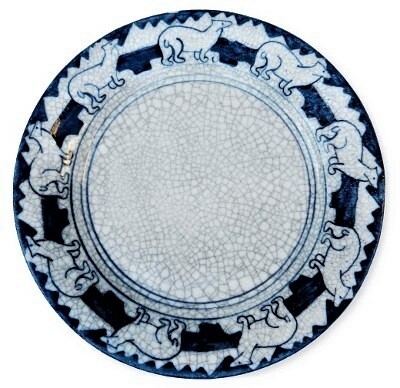 DEDHAM POTTERY "ELEPHANT" with baby Elephant pattern 6" bread and butter plate. Marked with the REGISTERED 1929-1943 back stamp. 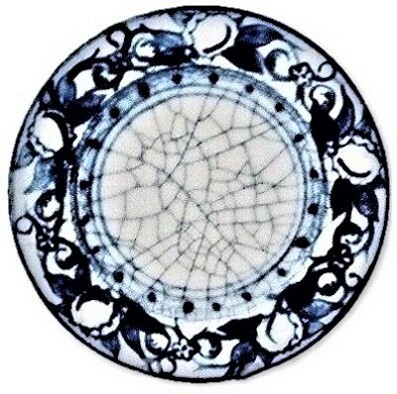 There are a few patches of glaze bubbling due to a slight over fire of the glaze of no harm and a tiny dot in the central area of the plate. No cracks or repairs. 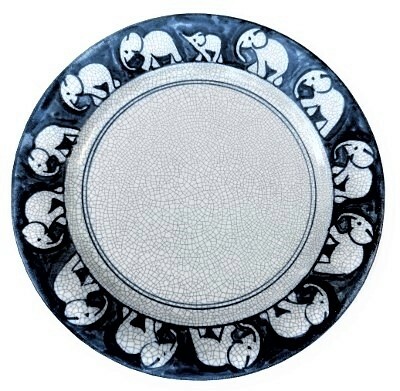 DEDHAM POTTERY "ELEPHANT" with baby Elephant pattern 8" breakfast plate. Marked with the REGISTERED 1929-1943 back stamp. 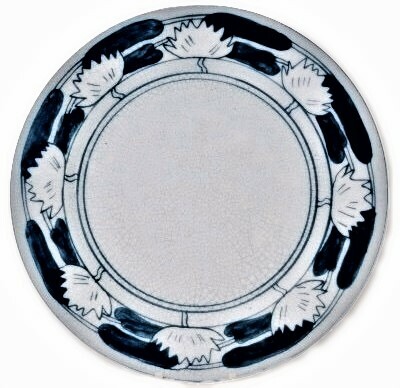 One of the cleanest and best decorated versions of this very scarce Dedham Pottery pattern plate. No cracks or repairs. 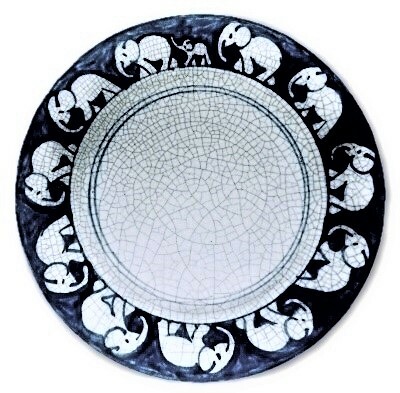 DEDHAM POTTERY "ELEPHANT" with baby Elephant pattern 10" dinner plate. Marked with the REGISTERED 1929-1943 back stamp. 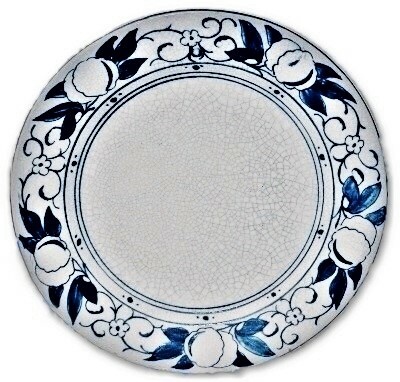 One of the cleanest and best decorated versions of this very scarce Dedham Pottery pattern plate in a very large size. No cracks or repairs. 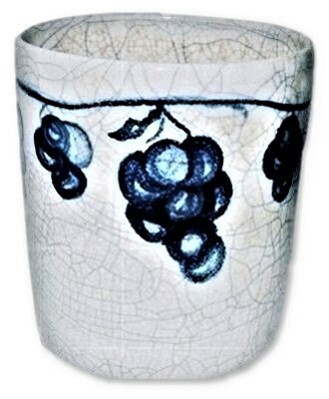 DEDHAM POTTERY "GRAPE" 7 1/8" No. 3 bowl. Marked with the 1896-1928 back stamp. Measures 7 1/8" across and sits 3 1/8" high. No chips, cracks or repairs. 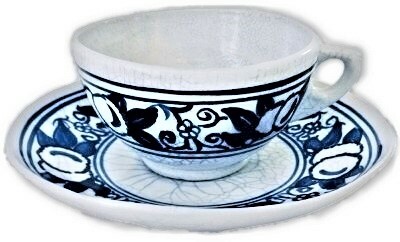 DEDHAM POTTERY tea cup and saucer in the "GRAPE" pattern. Marked with the Registered back stamp of 1929-1943. 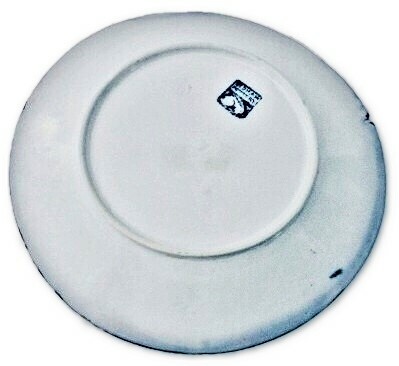 Saucer measures 6" across while the cup measures 4 5/8" across at the widest point and 2" high. No chips, cracks or repairs. 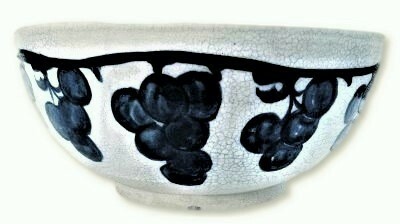 DEDHAM POTTERY "GRAPE" jam pot base. Marked with the 1929-1943 back stamp. Measures 3 5/8" across and sits 3 1/4" high. A tiny no show flat flake on the bottom edge. No other chips, cracks or repairs. DEDHAM POTTERY No. 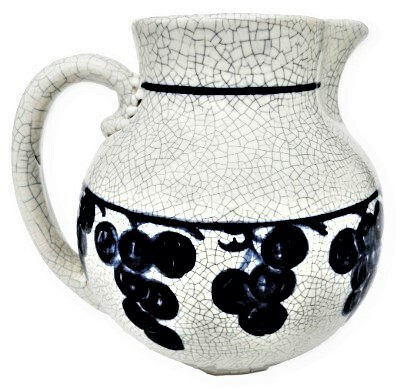 14 pitcher decorated in the "GRAPE" pattern. Marked with the Registered 1929-1943 back stamp. Measures 7 1/4" X 7" X 6". No chips, cracks or repairs. 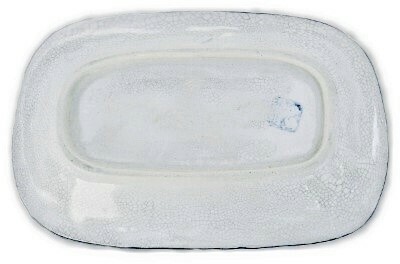 DEDHAM POTTERY artist signed with MAUDE DAVENPORTS REBUS "GRAPE" pattern 6" bread and butter plate. Marked with the 1896-1928 back stamp. No chips, cracks or repairs. 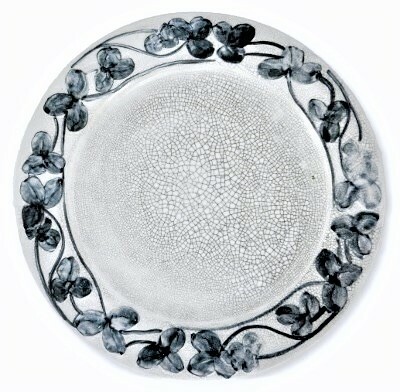 DEDHAM POTTERY artist signed with MAUDE DAVENPORTS REBUS "GRAPE" pattern 6 1/8" bread and butter plate. Marked with the 1896-1928 back stamp. 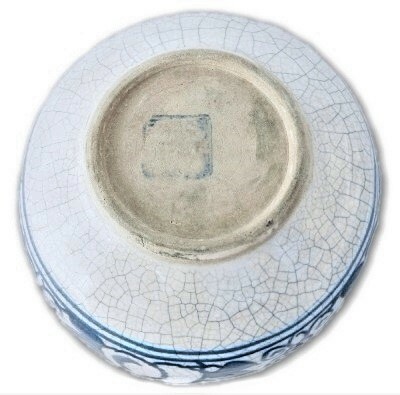 There is a small edge chip which someone had covered up with blue paint and another on the back edge in the same of a small clam shell which does not show to the front as well as a few tiny edge flea bites, no other, cracks or repairs. 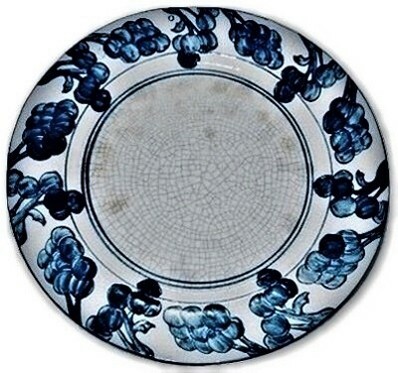 DEDHAM POTTERY "GRAPE" pattern 6 1/4" bread and butter plate. Marked with the 1896-1928 back stamp. No chips, cracks or repairs. 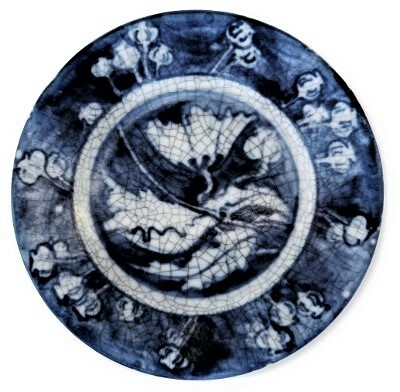 DEDHAM POTTERY artist signed with MAUDE DAVENPORTS REBUS "GRAPE" pattern 8 3/8" breakfast plate. Marked with the 1896-1928 back stamp. No chips, cracks or repairs. 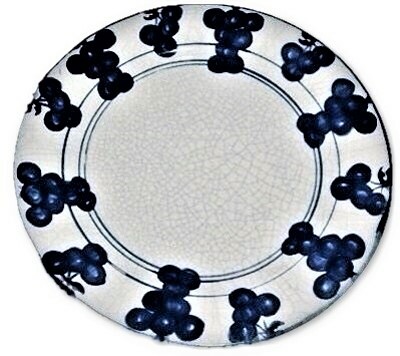 DEDHAM POTTERY artist signed with MAUDE DAVENPORTS REBUS "GRAPE" pattern 8 1/2" breakfast plate. Marked with the 1896-1928 back stamp. No chips, cracks or repairs. 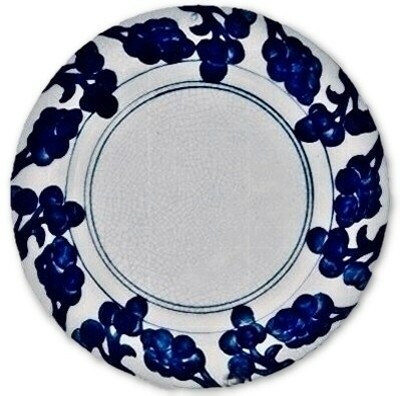 DEDHAM POTTERY artist signed with MAUDE DAVENPORTS REBUS "GRAPE" pattern 8 1/2" breakfast plate. Marked with the 1896-1928 back stamp. 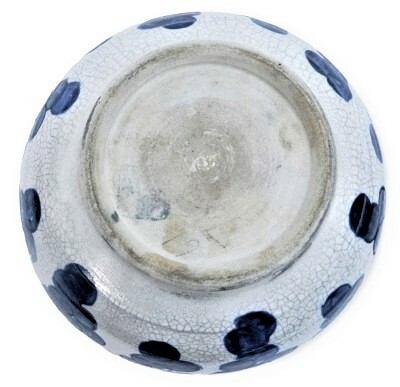 A 1/2" flat glaze flake on the reverse side of the outer rim as well as a few random tiny flea bite size glaze burst bubbles. No other chips, cracks or repairs. 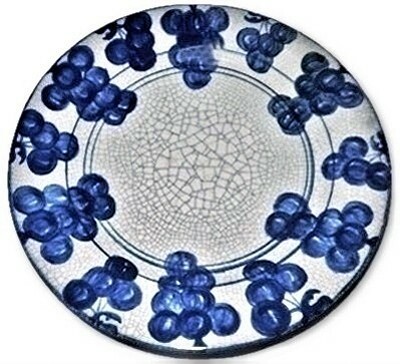 "GRAPE" pattern breakfast plate. Marked with the Registered 1929-1943 back stamp. Measures 8 1/2" across. 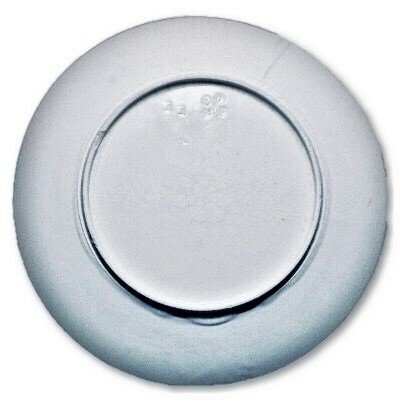 A manufacturing glaze flaw of collar base nicks. No other chips, cracks or repairs. 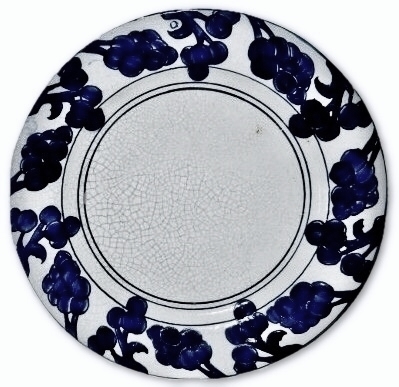 DEDHAM POTTERY "GRAPE" pattern 8 1/2" breakfast plate. Marked with the Registered 1929-1943 back stamp. No chips, cracks or repairs. 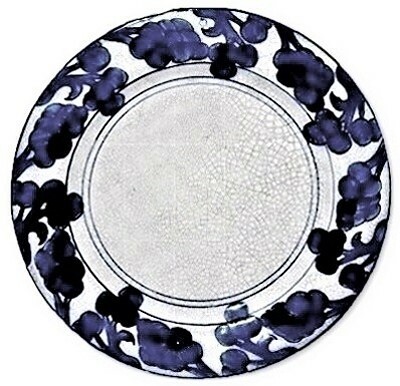 DEDHAM POTTERY "GRAPE" pattern breakfast plate. Dated 1931 along with the Registered 1929-1943 back stamp. Measures 8 1/2" across. No chips, cracks or repairs. 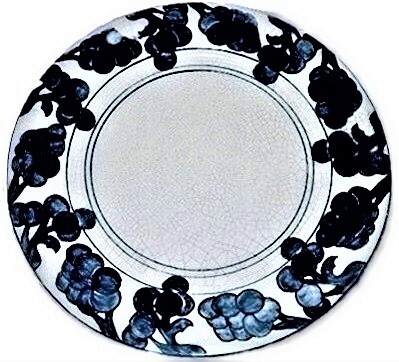 DEDHAM POTTERY "GRAPE" pattern 10" dinner plate. Marked with the 1896-1928 back stamp. No chips, cracks or repairs. 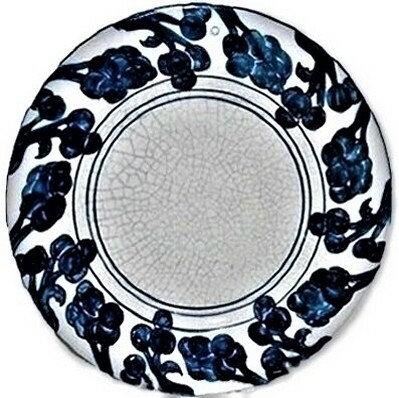 DEDHAM POTTERY "GRAPE" pattern 10" dinner plate artist signed with MAUDE DAVENPORT'S REBUS. Marked with the 1896-1928 back stamp. 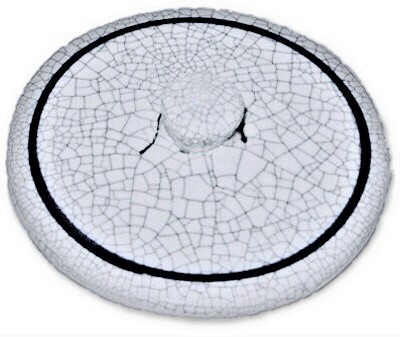 There are areas of discoloration under the glaze as well as a few small chips to the base rim which may be from the making process. No other chips, cracks or repairs. 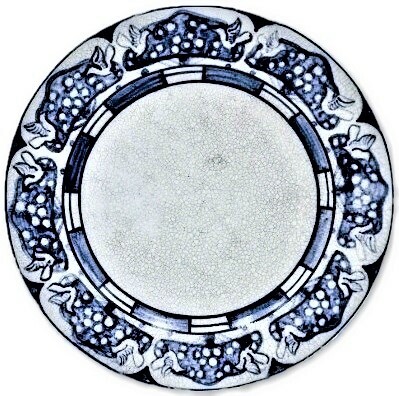 1896-1928 DEDHAM POTTERY "GRAPE" shallow soup plate. Marked with the 1896-1928 back stamp. Measures 8 1/2" across. No chips, cracks or repairs. 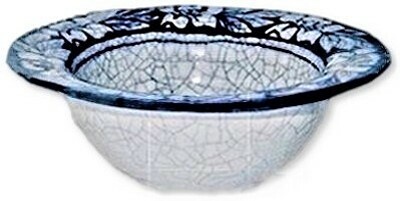 DEDHAM POTTERY "HORSE CHESTNUT" finger bowl. Marked with a partially obscured blue back stamp dating from 1896-1943. Slightly out of round, measures 5" X 2 1/2". No chips, cracks or repairs. 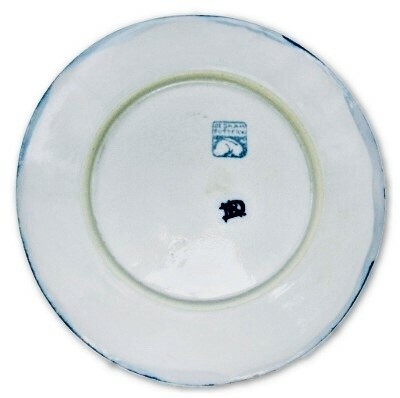 DEDHAM POTTERY "HORSE CHESTNUT" bacon rasher with 1896-1928 back stamp. 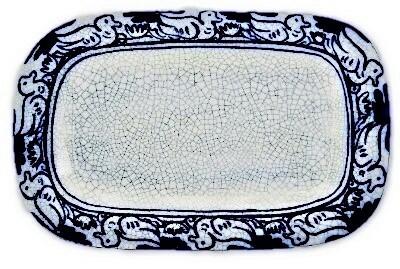 This form is listed in Dedham Potteries catalog as both a celery tray and bacon & egg tray. Measures 9 3/4" X 6 1/4" X 1 1/4". Bottom foot edge has several small in the making flakes. No other chips, cracks or repairs. DEDHAM POTTERY "HORSE CHESTNUT" tea cup and saucer. Marked with Dedham's 1896-1928 back stamp. 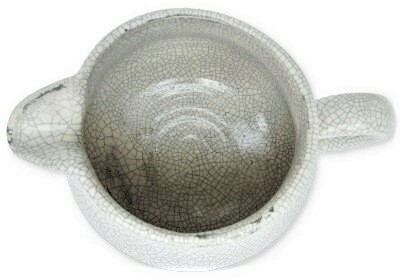 The cup has some in the making glaze anomalies on the edge such as slight glaze crawl as well as other manufacturing glaze flaws. 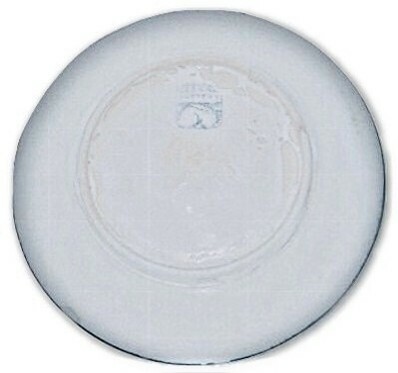 The saucer has light roughness to the edge. 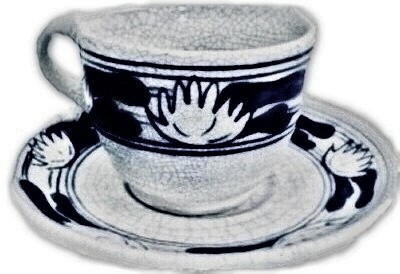 The saucer measures 6" X 1", the cup measures 5" X 2 1/4". No chips, cracks or repairs. DEDHAM POTTERY "HORSE CHESTNUT" tea cup and saucer. Marked with Dedham's 1896-1928 back stamp. 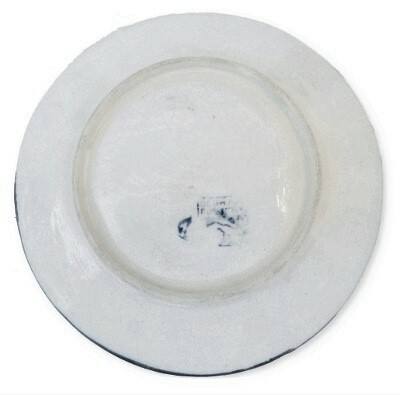 The saucer has a light roughness to the edge glaze from the manufacturing process bubbles etc. The saucer measures 6" X 1", the cup measures 5" X 2 1/4". No chips, cracks or repairs. 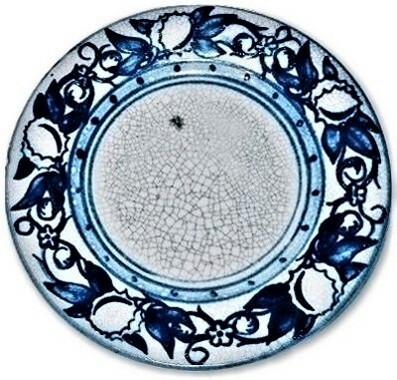 CHELSEA POTTERY U.S.-DEDHAM POTTERY 6" "HORSE CHESTNUT" bread and butter plate. Marked with the 1894-1896 impressed rabbit along with the RARE printed single rabbit mark. 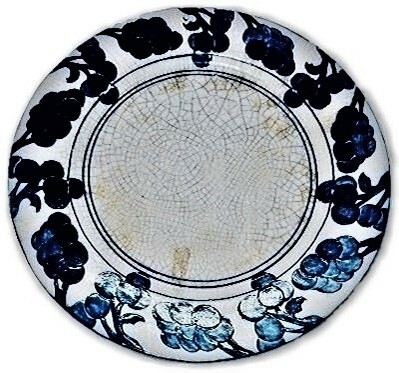 This example has a slightly raised pattern that does not exist on the later versions of the Horse Chestnut plates. No chips, cracks or repairs. 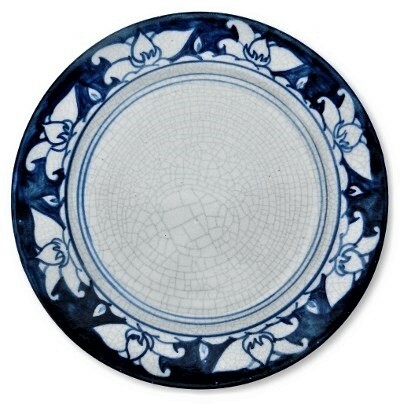 CHELSEA POTTERY U.S.-DEDHAM POTTERY 6" "HORSE CHESTNUT" bread and butter plate. Marked with the 1894-1896 impressed rabbit only mark. 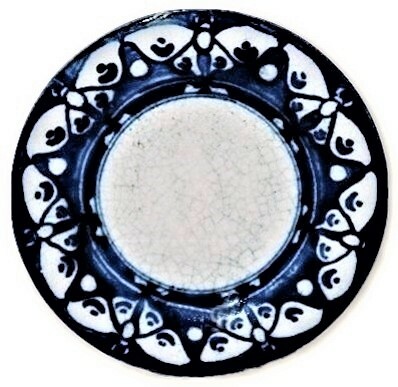 Several in the making and under the original glaze color skips, one dark pooled glaze seen on the face of the plate and one very tiny glaze only flea bite flake on the back of the rim. No other chips, cracks or repairs. DEDHAM POTTERY 6" "HORSE CHESTNUT" bread and butter plate. Marked with the 1896-1928 back stamp. No chips, cracks or repairs. 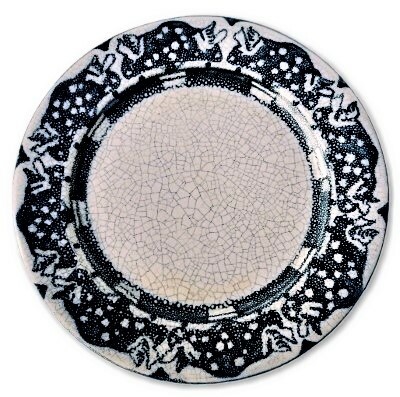 DEDHAM Art Pottery 6 1/4" "HORSE CHESTNUT" bread and butter plate. Marked with the Registered 1929-1943 back stamp. No chips, cracks or repairs. 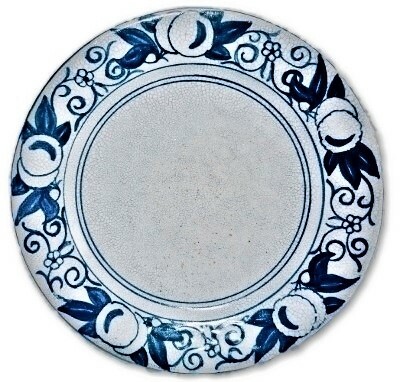 DEDHAM POTTERY 8 3/8" "HORSE CHESTNUT" breakfast size plate. Marked with the 1896-1928 back stamp. There are two very fine darkened lines on the reverse side only with no corresponding lines on the front or side. They appear to be in the making glaze only hairlines as they can not be felt, are exceedingly fine. One is located on the back outside edge area while the other line is located on the back glazed central area. The front surface has some firing peppering/pitting of no harm. No other chips, cracks or repairs. 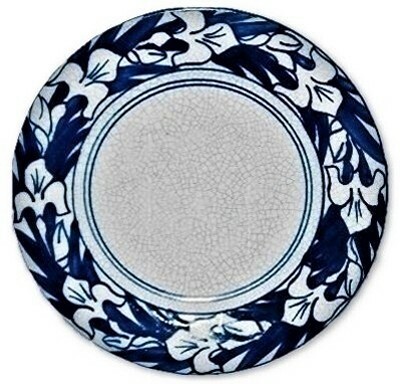 RARE CHELSEA POTTERY US "HORSE CHESTNUT" (raised) pattern 8 1/2" breakfast plate. Impressed on the reverse CPUS in a clover and an impressed "E E" along with a small impressed X with a tail. Dates from 1891-1895. Artist signed by Hugh Cornwall Robertson with his square painted monogram. Prior to starting the Dedham Pottery Company in Dedham Mass circa 1896. 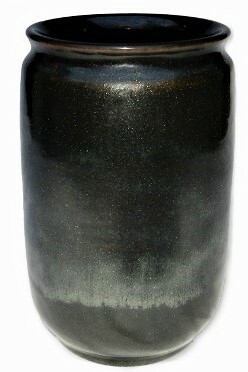 There is an unusual under the glaze hairline which appears to have occurred during the firing process and prior to the glaze application, as it barely shows to go through to the front surface. There is also a small chip on the foot ring. No other chips, cracks or repairs. 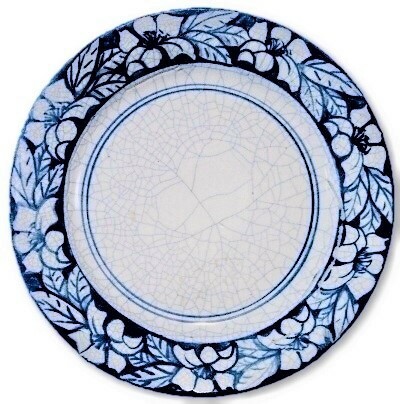 CHELSEA POTTERY U.S.-DEDHAM POTTERY 8 1/2" RAISED "HORSE CHESTNUT" breakfast plate. Marked with the 1894-1896 impressed rabbit only mark. 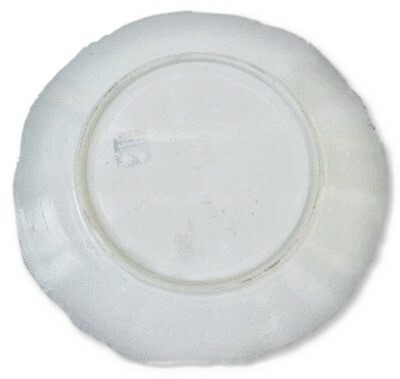 A 5/8" X 1/4" flat clam shell shaped chip along with a much smaller nearby flat glaze chip are located on the back side edge of the plate. They do not go through to the front where the outstanding earliest form of the RAISED HORSE CHESTNUT pattern is brilliant on display. No other chips, cracks or repairs. DEDHAM POTTERY 8 1/2" "HORSE CHESTNUT" breakfast size plate. Marked with the 1896-1928 back stamp. No chips, cracks or repairs. 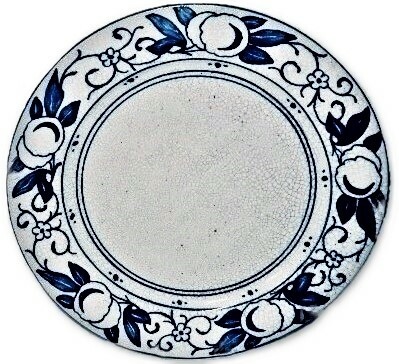 DEDHAM Pottery 8 1/2" "HORSE CHESTNUT" breakfast size plate. Maude Davenport's REBUS signature can be seen between two of the tendrils. Marked with the 1896-1928 back stamp. No chips, cracks or repairs. DEDHAM Pottery 8 1/2" "HORSE CHESTNUT" breakfast size plate. Maude Davenport's REBUS signature can be seen between two of the tendrils. Marked with the 1896-1928 back stamp. There is a very small flat chip/flake on the back side of the rim which can not be seen from the front. No other chips, cracks or repairs. 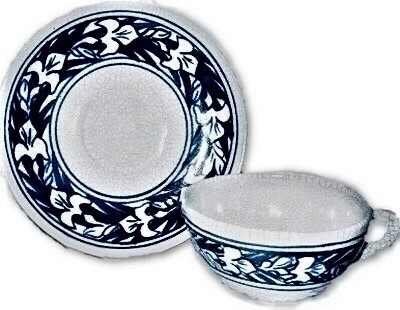 DEDHAM POTTERY "HORSE CHESTNUT" pattern 8 3/4 X 1 1/8" shallow soup plate. Marked with the DEDHAM back stamp and a faintly impressed C.P.U.S mark. Several pits/glaze pops hidden within the pattern as well as a glaze crawl as seen in our image from the 6 o'clock to 9 o'clock positions. Light warp to the form. No chips, cracks or repairs. 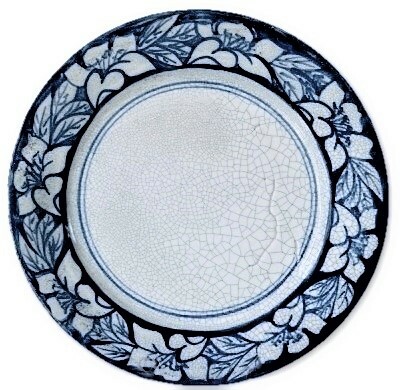 DEDHAM POTTERY 9 3/4" "HORSE CHESTNUT" dinner size plate. Marked with the 1896-1928 back stamp. There is some very minor surface pitting from the firing process No chips, cracks or repairs. 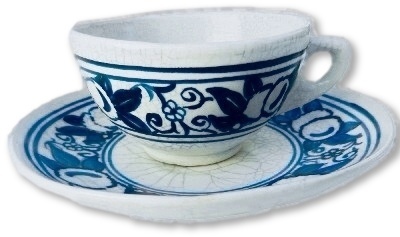 DEDHAM POTTERY "IRIS" tea cup and saucer. Marked with Dedham's 1896-1928 back stamp. The saucer measures 6 1/4", the cup measures 2 1/8" X 4 3/4" X 3 7/8". No chips, cracks or repairs. 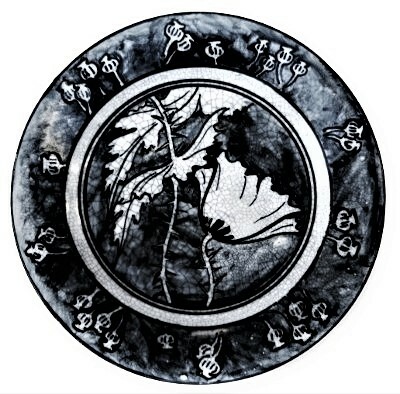 DEDHAM POTTERY "IRIS" pattern 6" bread and butter plate artist signed by MAUDE DAVENPORT with her REBUS mark, along with the 1896-1928 back stamp. No chips, cracks or repairs. 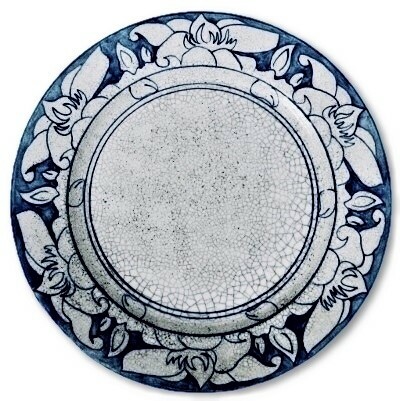 DEDHAM POTTERY "IRIS" pattern 6" bread and butter plate artist signed by MAUDE DAVENPORT with her REBUS mark, along with the 1896-1928 back stamp. Extremely well decorated. There is a couple making collar base edge flea bite nicks, no chips, cracks or repairs. 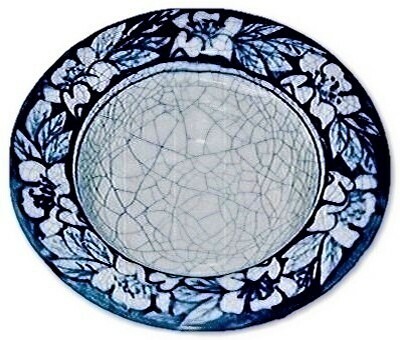 DEDHAM POTTERY "IRIS" pattern 6" bread and butter plate artist signed by MAUDE DAVENPORT with her REBUS mark, along with the 1896-1928 back stamp. Extremely well decorated. There is some firing pitting/peppering and one small back edge flake/chip. No other chips, cracks or repairs. 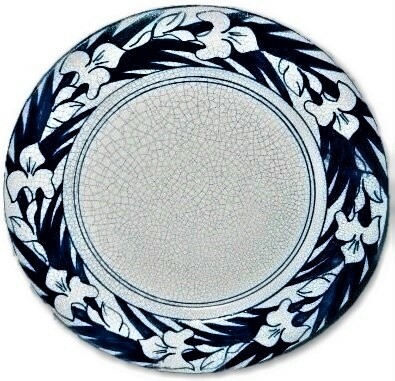 DEDHAM POTTERY "IRIS" pattern 6 1/8" bread and butter. Marked with the 1896-1928 back stamp. No chips, cracks or repairs. 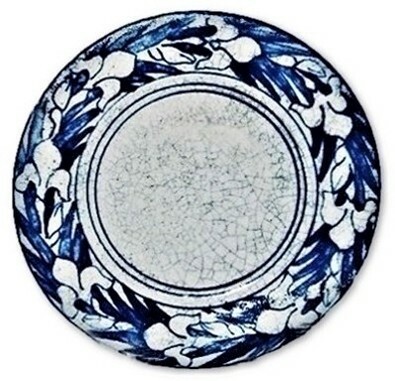 DEDHAM Art Pottery 7 1/2" X 7/8" "IRIS" salad plate. Marked with the REGISTERED back stamp as well as being dated 1932. No chips, cracks or repairs. 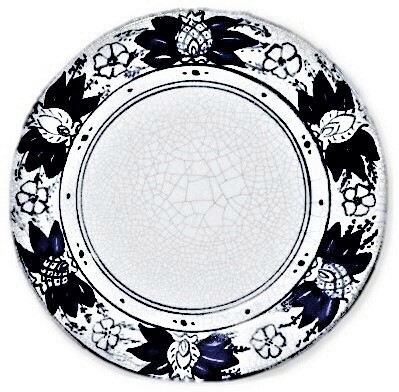 DEDHAM POTTERY "IRIS" pattern 7 5/8" salad plate. Marked with the Registered 1929-1943 back stamp. Unusual matte glaze. No chips, cracks or repairs. 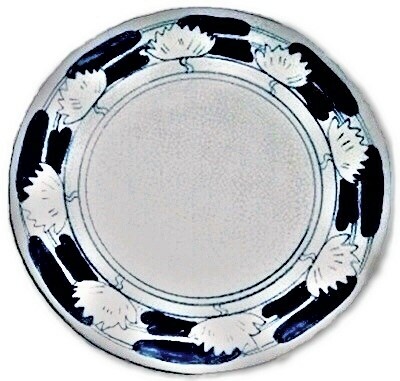 8 1/2" BREAKFAST PLATE MAUDE DAVENPORT 1904-1928 "N"
DEDHAM POTTERY "IRIS" pattern 8 1/2" breakfast size plate artist signed by MAUDE DAVENPORT with her REBUS mark, capital N along with the 1896-1928 back stamp. Measures 8 1/2" across and sits 1" high. No chips, cracks or repairs. 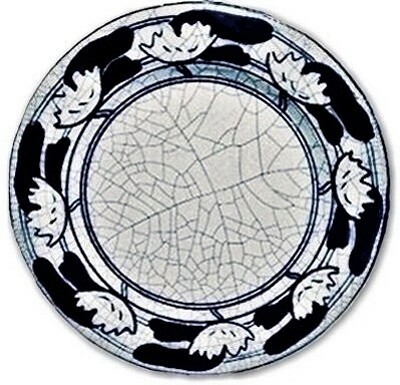 DEDHAM POTTERY "IRIS" pattern 8 1/2" breakfast size plate artist signed by MAUDE DAVENPORT with her REBUS mark, capital N along with the 1896-1928 back stamp. Measures 8 1/2" across. No chips, cracks or repairs. 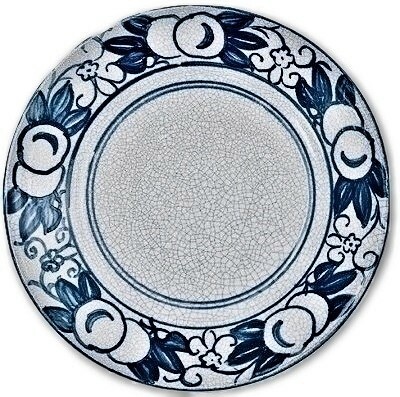 DEDHAM POTTERY "IRIS" pattern 8 3/4" breakfast size plate with the 1896-1928 back stamp. No chips, cracks or repairs. 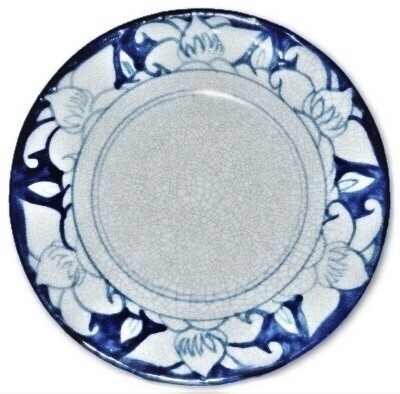 DEDHAM POTTERY "IRIS" breakfast plate marking Dedham Massachusetts Tercentenary Anniversary of 1636-1936. Marked with the "DEDHAM TERCENTENARY 1636-1936" back stamp. Measures 8 1/2". No chips, cracks or repairs. DEDHAM POTTERY "IRIS" pattern 9 7/8" dinner plate marked with the 1896-1928 back stamp. 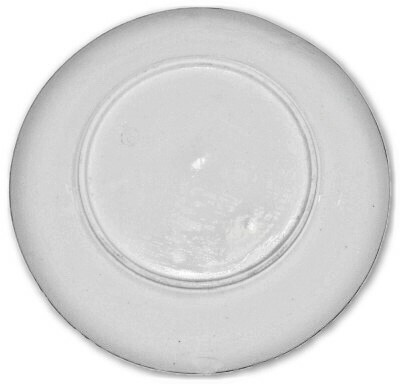 This is an unusual light example with a pink tinge to the glaze which is more noticeable on the reverse side than the front. 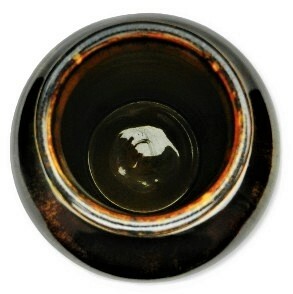 While there is one area of the Iris decoration seen at the 12:00 position which shows the normal clear glaze instead. No chips, cracks or repairs. 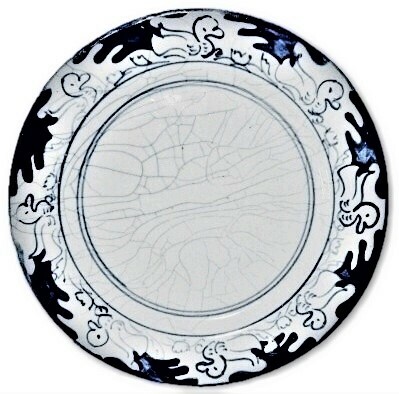 DEDHAM POTTERY "IRIS" pattern 9 7/8" dinner plate artist signed by MAUDE DAVENPORT with her REBUS mark along with the 1896-1928 back stamp. There is one very small possibly in the making collar rim flake, no chips, cracks or repairs. 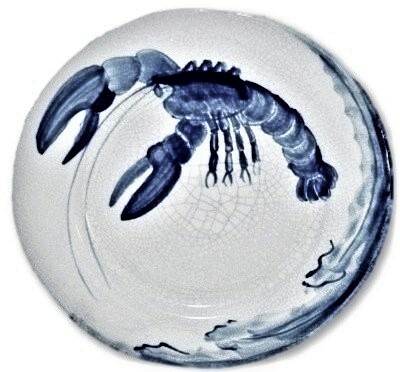 DEDHAM POTTERY "LOBSTER" pattern scarce salad size plate. Measures 7 5/8" across. Marked with the Registered 1929-1943 back stamp. No chips, cracks or repairs. 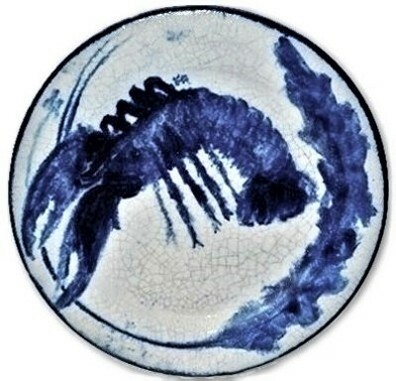 DEDHAM POTTERY "LOBSTER" pattern 8 3/8" breakfast plate, artist signed HCR for "HUGH C. ROBERTSON". Marked with the early version of the Dedham back stamp and dates between 1896-1908. 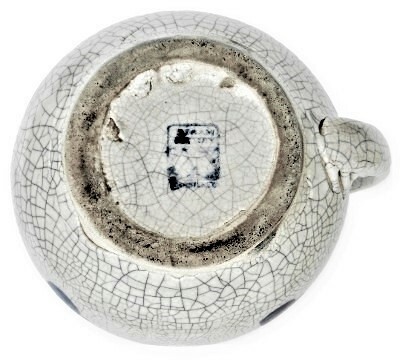 A base foot ring potter sliver chip from the potters removal process and a tiny glaze pop located in the sea weed pattern, no other chips, cracks or repairs. 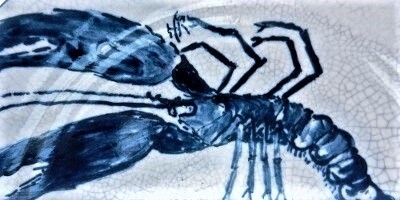 DEDHAM POTTERY "LOBSTER" pattern 8 5/8" breakfast plate, artist signed HCR for "HUGH C. ROBERTSON". Marked with the 1896-1908 back stamp. No chips, cracks or repairs. 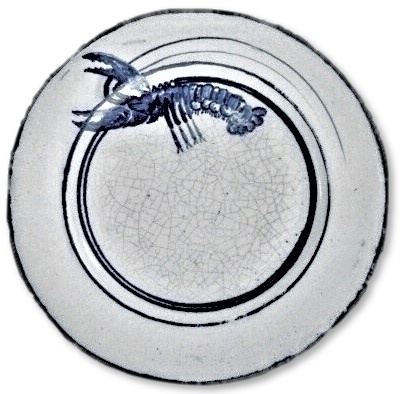 DEDHAM POTTERY "LOBSTER" Variant (note the simple circles instead of the normal sea weed) pattern 8 1/2" breakfast plate. Marked with the 1896-1928 back stamp. There is a flat chip on the back side of the outer edge as well as a wedge shaped chip on the opposite side, a few foot ring nicks as well. No cracks or repairs. DEDHAM POTTERY "MAGNOLIA" 5 1/2" No. 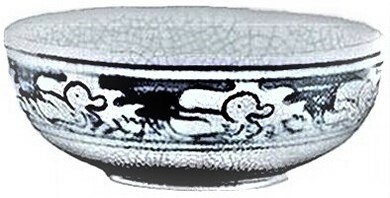 5 bowl with the 1896-1928 back stamp. Measures 5 1/2" X 2 1/2". No chips, cracks or repairs. 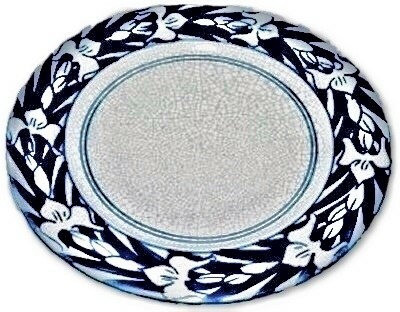 DEDHAM POTTERY 6" "MAGNOLIA" bread and butter plate. Marked with the 1896-1928 back stamp. No chips, cracks or repairs. 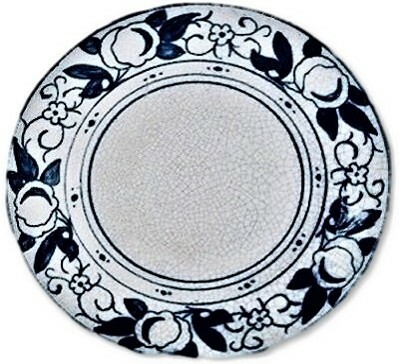 DEDHAM POTTERY 6" "MAGNOLIA" bread and butter plate. Marked with the 1929-1943 REGISTERED back stamp. No chips, cracks or repairs. 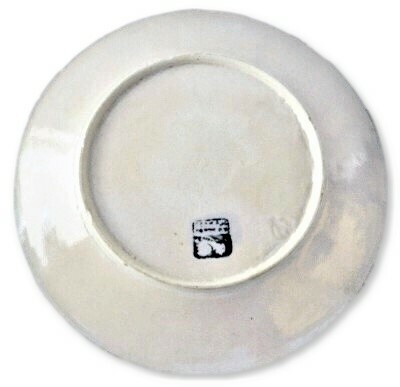 DEDHAM POTTERY 8 1/2" RAISED "MAGNOLIA" breakfast size plate. Marked with the 1896-1928 back stamp. No chips, cracks or repairs. 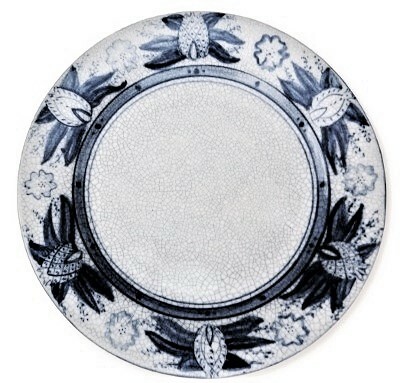 DEDHAM POTTERY 8 1/2" "MAGNOLIA" breakfast size plate. Marked with the 1896-1928 back stamp. No chips, cracks or repairs. 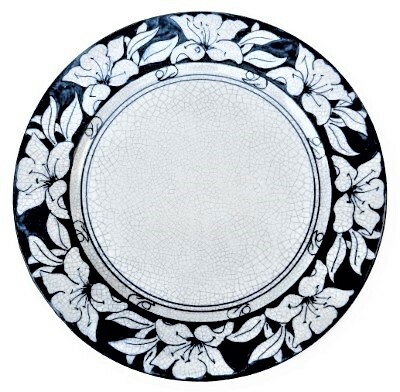 DEDHAM POTTERY 10" "MAGNOLIA" dinner size plate. Marked with the 1929-1943 back stamp. There is what appears to be a small foot rim chip from the manufacturing process No other chips, cracks or repairs. 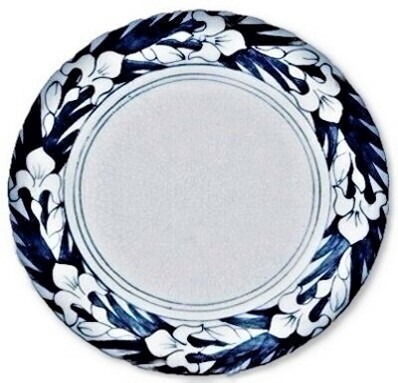 DEDHAM POTTERY 10 1/4" RAISED "MAGNOLIA" dinner size plate. Marked with only one single impressed rabbit and no back stamp dating this from 1891-1895. 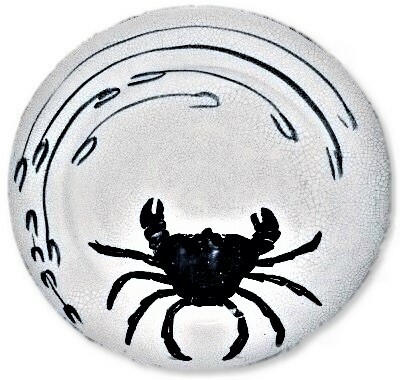 There a few in the making under the glaze color skips as seen in our image. None of these are damage. No chips, cracks or repairs. DEDHAM POTTERY "MAGNOLIA" pattern 8 1/2" shallow soup plate. Marked with the REGISTERED 1929-1943 back stamp. 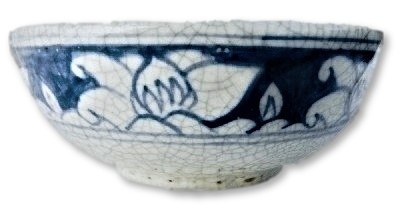 There is a small dark spot where the glaze did not cover. No chips, cracks or repairs. 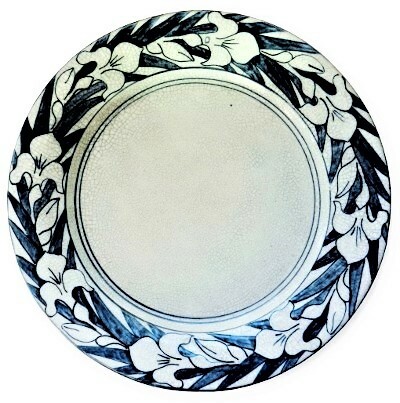 DEDHAM POTTERY "MAGNOLIA" pattern 8 3/4" shallow soup plate. Marked with the REGISTERED 1929-1943 back stamp. This is a very unusual example of this pattern due to the painted pattern has 5 instead of the normally found 6 magnolia flowers. No chips, cracks or repairs. 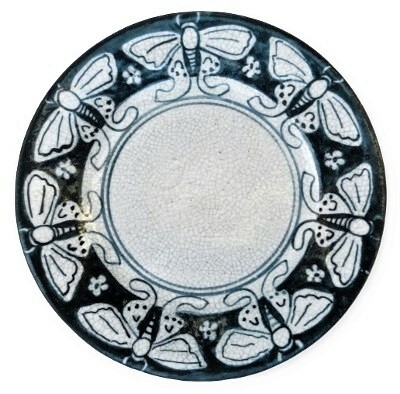 DEDHAM POTTERY "MOTH" pattern artist signed with MAUDE DAVENPORT'S REBUS 6" bread and butter plate. Marked with the 1896-1928 back stamp. 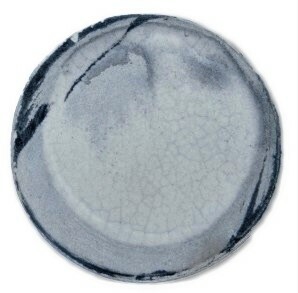 There is a small glaze flake along the rim allowing small white dot of the clay beneath to show. No other chips, cracks or repairs. 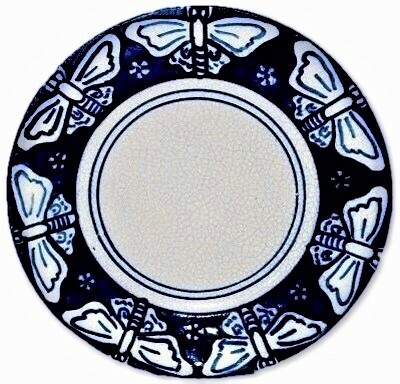 DEDHAM POTTERY "MOTH" variant pattern 6" bread and butter plate. Marked with the 1896-1928 back stamp. There are a few tiny manufacturing base foot rim flea bite flakes. No other chips, cracks or repairs. 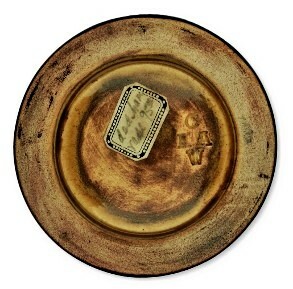 RARE DEDHAM POTTERY "MOTH" 6" bread and butter plate in stunning "GREEN" Marked with the 1896-1928 back stamp. No chips, cracks or repairs. 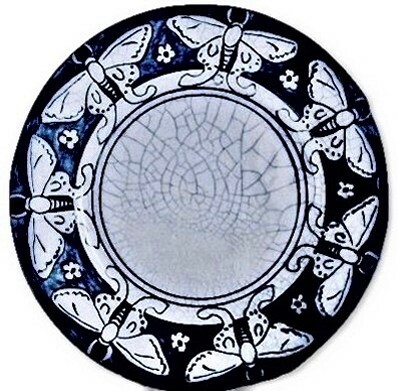 DEDHAM POTTERY "MOTH" pattern 8 1/2" breakfast size plate with 1896-1928 back stamp. 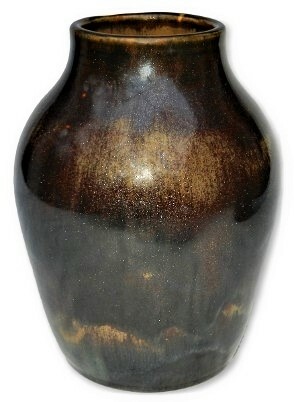 There is an under the original glaze manufacturing flaw which is not damage. We show this in the close up, which appears to have bumped into another item after decoration yet prior to the glazing and firing process. Measures 8 1/2" across. No chips, cracks or repairs. 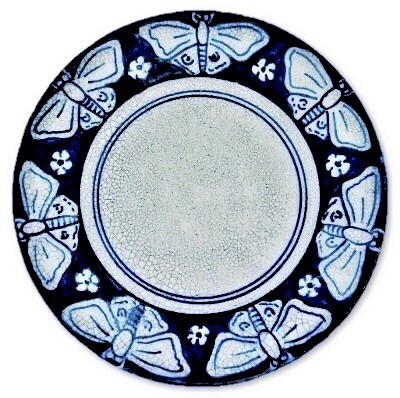 "SCARCE" DEDHAM POTTERY "MOTH" pattern 8 1/2" breakfast size plate with 1896-1928 back stamp. Measures 8 1/2" across and sits 1" high. 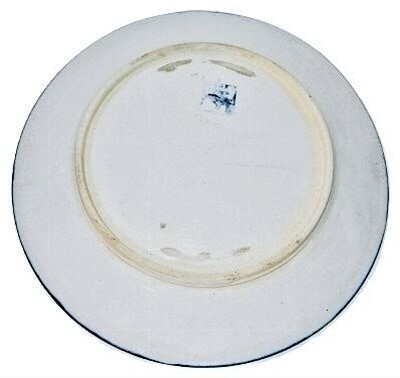 The base foot ring has 2 spots where the manufacturing process left small chip like marks yet these both exhibit glaze coverage. 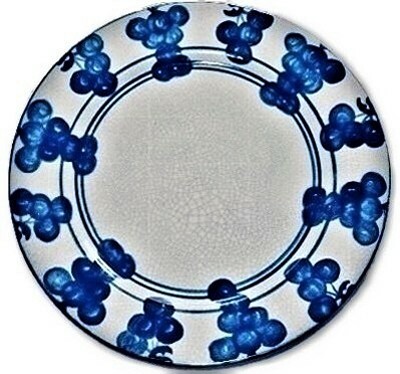 There is also a small area of tiny open bubbles on the rim which are not as smooth as the rest of the rim. No other condition issues, chips, cracks or repairs. 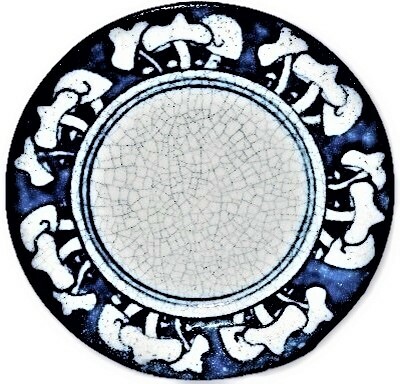 DEDHAM POTTERY "ENGLISH MUSHROOM" pattern 5 3/4" bread and butter plate. Marked with the early version of the Dedham back stamp and dates between 1896-1928. No other chips, cracks or repairs. 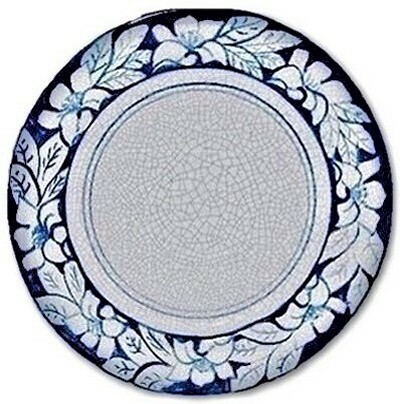 DEDHAM POTTERY "ENGLISH MUSHROOM" pattern MAUDE ROSE DAVENPORT 6" bread and butter plate, artist signed with her REBUS faintly visible. Marked with the early version of the Dedham back stamp and dates between 1896-1928. 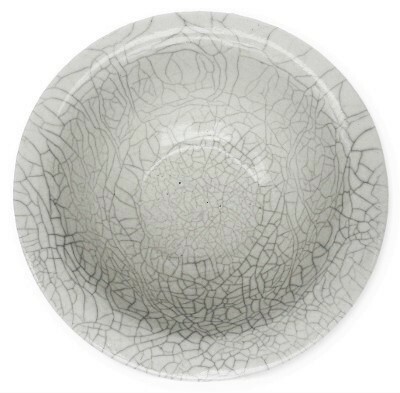 There are minor glaze peppering to the decorated surface from the firing process. No other chips, cracks or repairs. 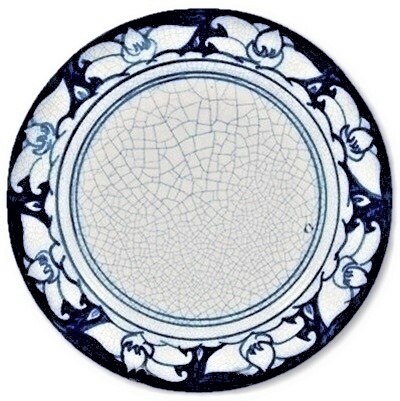 DEDHAM POTTERY "ENGLISH MUSHROOM" pattern 8 1/2" breakfast plate, artist signed HCR for "HUGH C. ROBERTSON" and hidden very well in the dark blue area of the boarder. Marked with the early version of the Dedham back stamp and dates between 1896-1908 when Hugh C. Robertson passed away. There is minor peppering to the glaze, little manufacturing discoloration and several flakes on the collar base. No other chips, cracks or repairs. 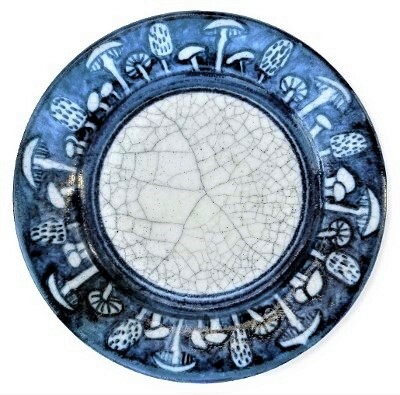 DEDHAM POTTERY "ENGLISH MUSHROOM" pattern 8 1/2" breakfast plate, artist signed HCR for "HUGH C. ROBERTSON". Marked with the early version of the Dedham back stamp and dates between 1896-1908 when Hugh C. Robertson passed away. 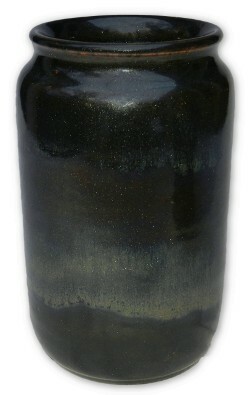 There are a few dark spots under the original glaze and a base rim nick from the manufacturing process. No other chips, cracks or repairs. 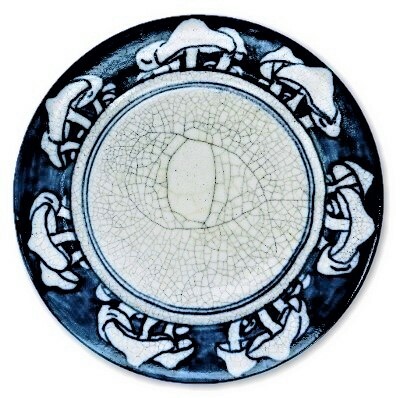 DEDHAM POTTERY "ENGLISH MUSHROOM" pattern MAUDE ROSE DAVENPORT 8 3/8" breakfast plate, artist signed with her REBUS. Marked with the early version of the Dedham back stamp and dates between 1896-1928. 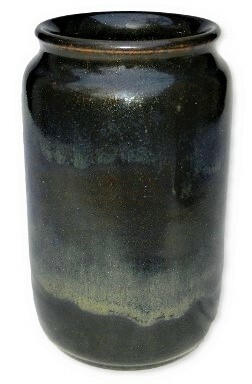 There are minor glazed over color skips on the edge, a small glaze loss seen at the 8:00 position and several very minor manufacturing nicks to the collar base. No other chips, cracks or repairs. 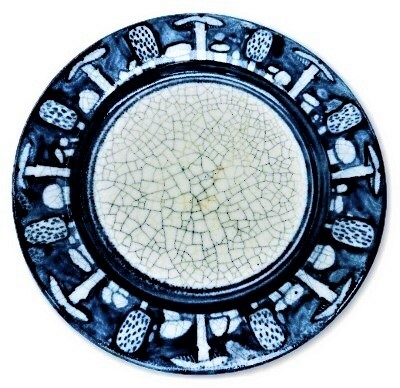 DEDHAM POTTERY "ENGLISH MUSHROOM" 8 1/2" breakfast plate. Marked with the 1896-1928 back stamp. This example has wonderful dark blue color. There are a few minor foot rim nicks from the manufacturing process. No chips, cracks or repairs. 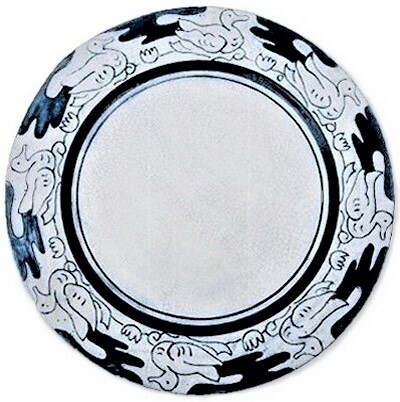 DEDHAM POTTERY "FRENCH MUSHROOM" pattern 8 1/2" breakfast plate, artist signed with an exceedingly RARE monogram MRD for "MAUDE ROSE DAVENPORT". This item is marked with the early version of the Dedham back stamp and dates between 1896-1928 back stamp. 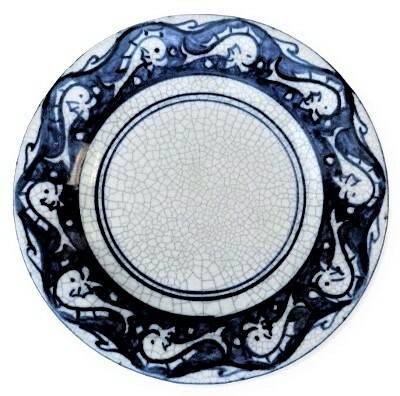 The condition of this plate is OUTSTANDING and the decoration is the finest we have ever seen in the FRENCH MUSHROOM pattern. No chips, cracks or repairs. 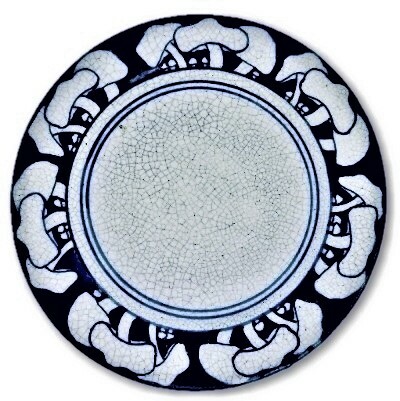 DEDHAM POTTERY "FRENCH MUSHROOM" pattern 8 5/8" breakfast plate, artist signed HCR for "HUGH C. ROBERTSON". Marked with the early version of the Dedham back stamp and dates between 1896-1908. 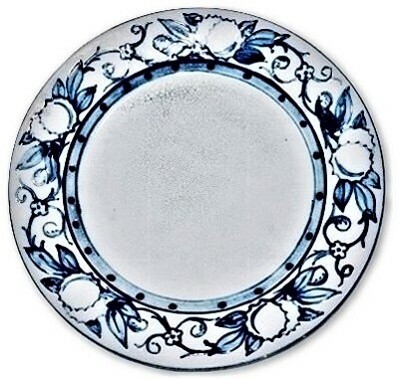 There are several chips, flakes on the base collar rim but considering how RARE this HCR FRENCH MUSHROOM plate is, they are not as important as they might be on a lesser pattern without the artist signature. No other chips, cracks or repairs. 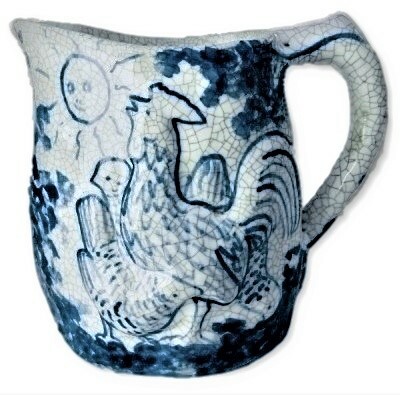 DEDHAM POTTERY "NIGHT & MORNING" pitcher. This is one of the cleanest examples we have ever seen offered for purchase. Marked with the 1929-1943 REGISTERED back stamp. Super tight crackle and very clean condition. 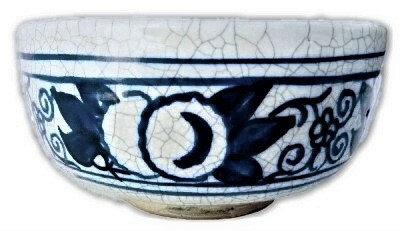 Shows a Rooster and Sun on one side and Owl and crescent moon on the other side. Measures 5 1/2" X 5" X 3 1/4". No chips, cracks or repairs. DEDHAM POTTERY "PINEAPPLE" 8 1/2" breakfast plate. Marked with the 1896-1928 back stamp. No chips, cracks or repairs. 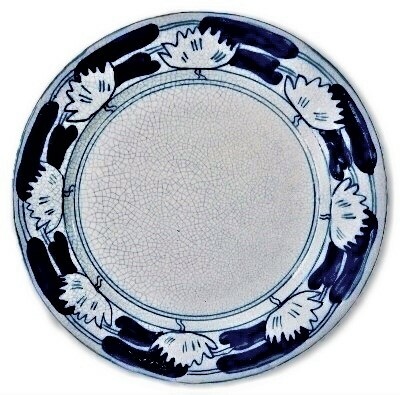 DEDHAM POTTERY "PINEAPPLE" 8 1/2" breakfast plate. Marked with the REGISTERED 1929-1943 back stamp. An in the making small foot ring slice under the original glaze. No chips, cracks or repairs. 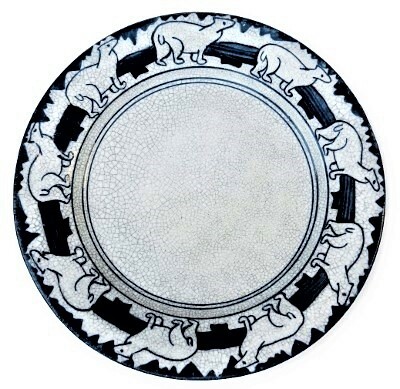 DEDHAM POTTERY "POLAR BEAR" pattern 8 5/8" breakfast size plate. Marked with the 1896-1928 back stamp. Extremely well decorated, wonderful crackle effect all executed. 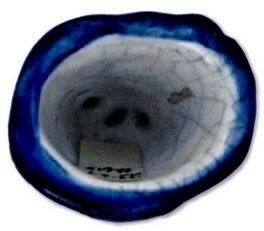 There several small foot making edge chipping when the item was removed from the kiln. These are on the inside of the ring. No other chips, cracks or repairs. 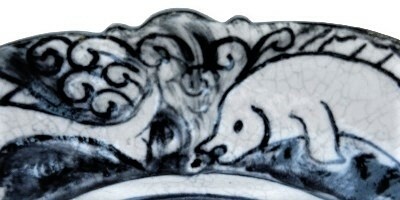 DEDHAM POTTERY RARE "POLAR BEAR" pattern 8 1/2" breakfast size plate artist signed by MAUDE DAVENPORT with her REBUS mark, along with the 1896-1928 back stamp. No chips, cracks or repairs. 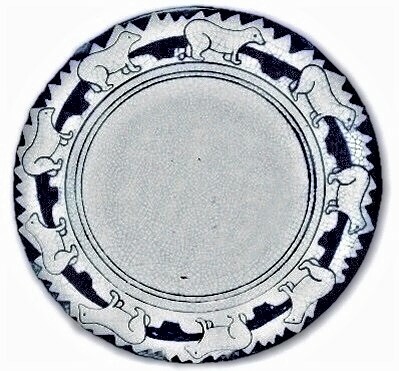 DEDHAM POTTERY "POLAR BEAR" pattern 8" breakfast size plate. Marked with the 1929-1943 REGISTERED back stamp. The foot ring displays somewhat appears to be in the making edge chipping when the item was removed from the kiln. No other chips, cracks or repairs. DEDHAM POTTERY "POND LILY" pattern tea cup and saucer. Marked with the 1929-1943 REGISTERED back stamp. The saucer measures 6" X 1" while the cup measures 4 1/2" X 2 3/4". No chips, cracks or repairs. 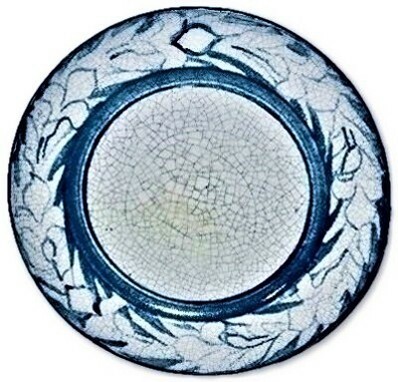 DEDHAM Art Pottery 8 1/4" POND LILY breakfast size plate. This item is an unusual Teal/Blue coloring instead of the normally found blue decoration. 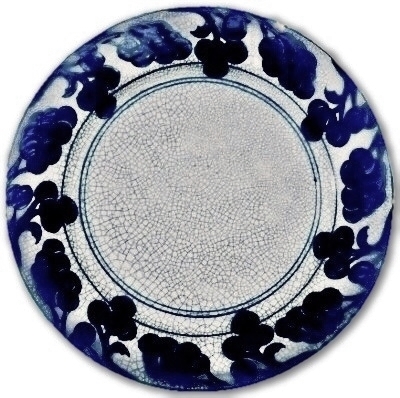 The shape also suggests that this item is possibly the "Shallow Soup Plate". Marked with the 1896-1928 back stamp. No chips, cracks or repairs. 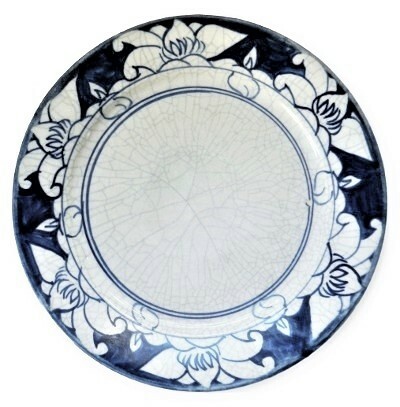 DEDHAM POTTERY "POND LILY" 8 3/8" breakfast plate. Marked with the 1896-1928 back stamp. No chips, cracks or repairs. DEDHAM POTTERY "POND LILY" 8 1/2" breakfast size plate. Marked with the 1896-1928 back stamp. The glaze has some peppering/pin pricks and one foot ring in the making nick. No other chips, cracks or repairs. 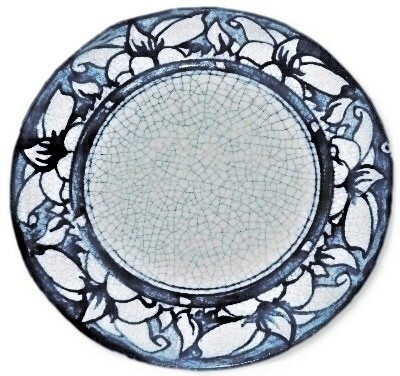 DEDHAM Art Pottery 8 1/2" X 1" POND LILY breakfast size plate. Marked with MAUDE DAVENPORT'S REBUS. Marked with the 1896-1928 back stamp. No chips, cracks or repairs. 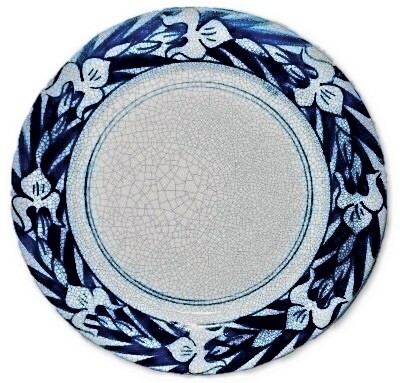 CHELSEA/DEDHAM POTTERY RAISED "POND LILY" 8 3/4" breakfast plate. Some in the making edge under glaze color skips and manufacturing base ring removal flakes. Marked with the single impressed rabbit mark and NO back stamp. No chips, cracks or repairs. 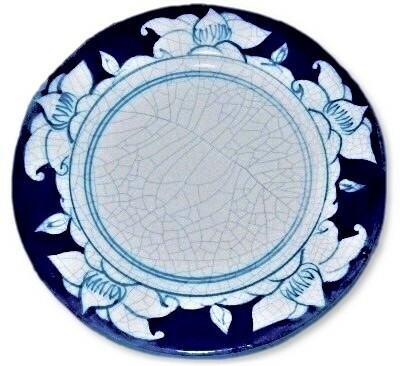 DEDHAM POTTERY "POND LILY" 8 3/4" breakfast plate. Some in the making edge roughness/glaze pop/flakes. Marked with the REGISTERED 1929-1943 back stamp. No chips, cracks or repairs. 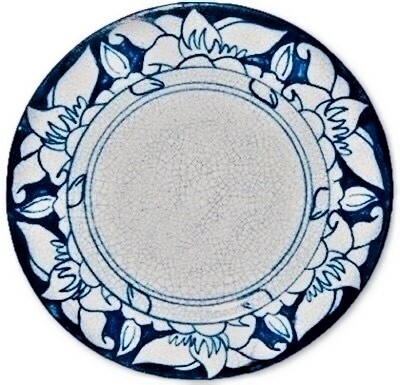 DEDHAM POTTERY "POND LILY" 10" dinner plate. 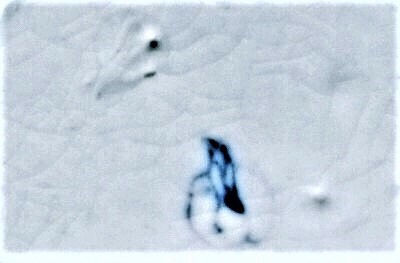 There is a small burst glaze bubble as seen @6:00 position as well as some in the making tiny firing burst bubbles along a small section of the outer edge. None are distracting nor post production damage. Marked with the 1896-1928 back stamp. No chips, cracks or repairs. 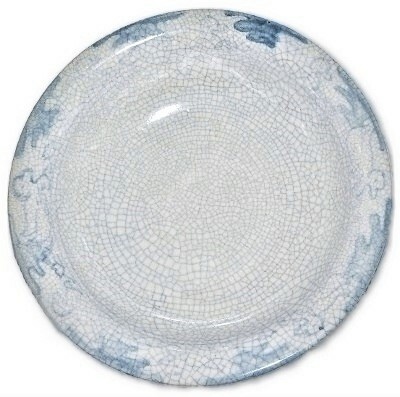 DEDHAM POTTERY "POND LILY" 10" dinner plate. 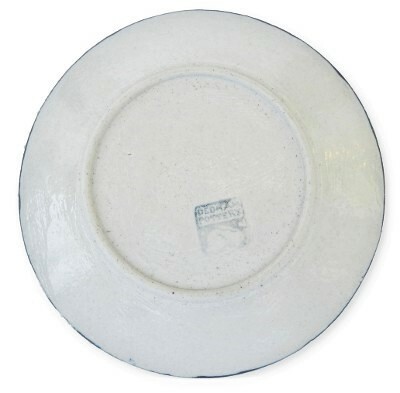 Very good overall condition, with two small in the making marks in the central portion of the plate as well as a few extremely tiny glaze skips on the edge and a tiny spot of roughness on the foot ring. Marked with the 1896-1928 back stamp. No chips, cracks or repairs. 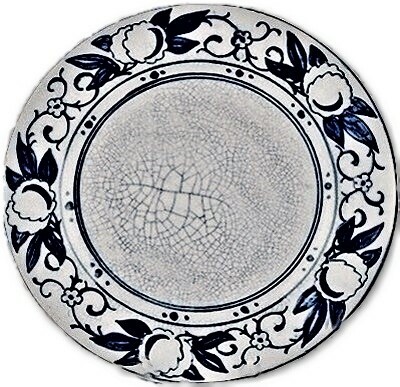 DEDHAM Art Pottery 10 1/4" POND LILY dinner size plate. Marked with MAUDE DAVENPORT'S REBUS 1904-1928. Marked with the 1896-1928 back stamp. 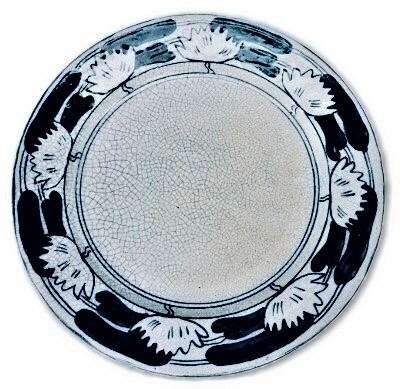 There is some light thin glaze, some under glaze outline markings around several of the lily and there are a number of small flakes and small chips to the outer/back edge of the plate. 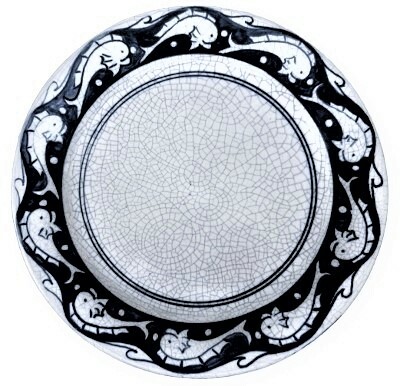 A very difficult size, pattern, artist signed Maude Davenport plate to find in any condition. CHELSEA POTTERY U.S.-DEDHAM POTTERY 6" "POPPY" bread and butter plate. Marked with the 1894-1896 impressed rabbit only mark. No chips, cracks or repairs. 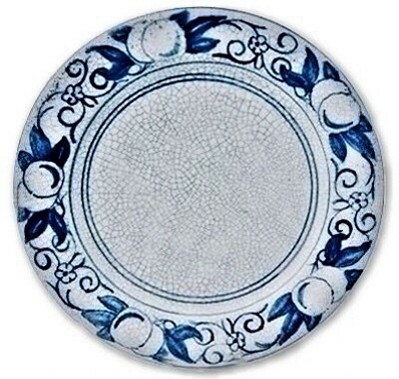 CHELSEA POTTERY U.S.-DEDHAM POTTERY 8 5/8" "POPPY" breakfast plate. Marked with the 1894-1896 impressed rabbit only mark. This example may well be one of the finest versions of this early pattern you may ever find. 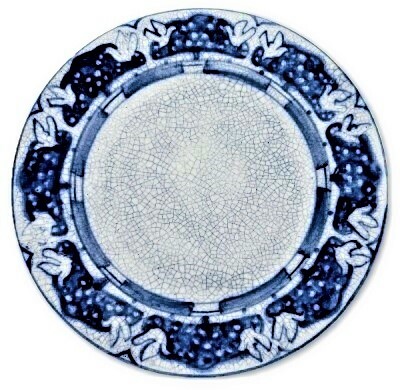 Several, tiny, and random glaze bubble burst can be found on the face of the plate. No chips, cracks or repairs.